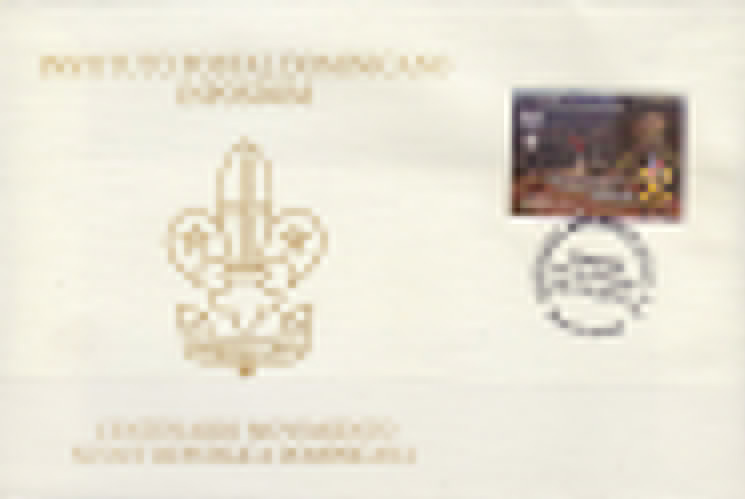 Text information for the bulletin provided by Jorge Enrique Rivero Ortiz, Presidente Consejo Scout Nacional and Diego Ospina Duque. 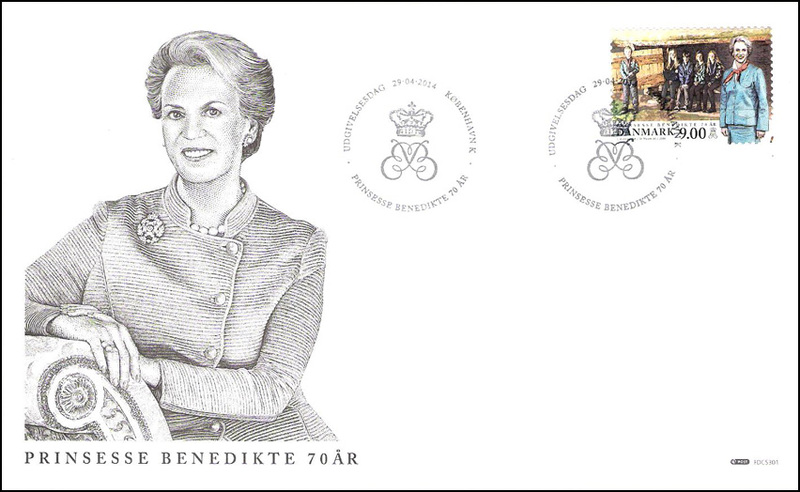 The portrait on the first day cover was drawn by German engraver Wolfgang Mauer based on the latest official portrait of the princess taken by Christina Hauschildt. 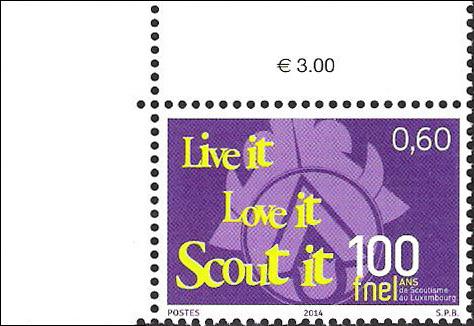 Single for the Centenary of the Scout Movement. 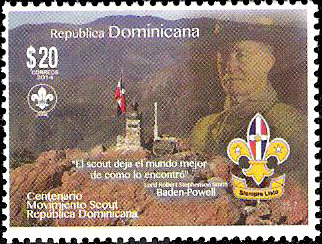 Dominican Republic Scout badge and image of Baden-Powell with one of B-P's favorite sayings in fine print, "The Scout leaves the world better than how he found it." 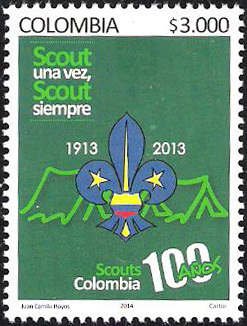 The view in the background is of a bronze bust of Juan Pablo Duarte next to a flag pole with the Dominican flag. 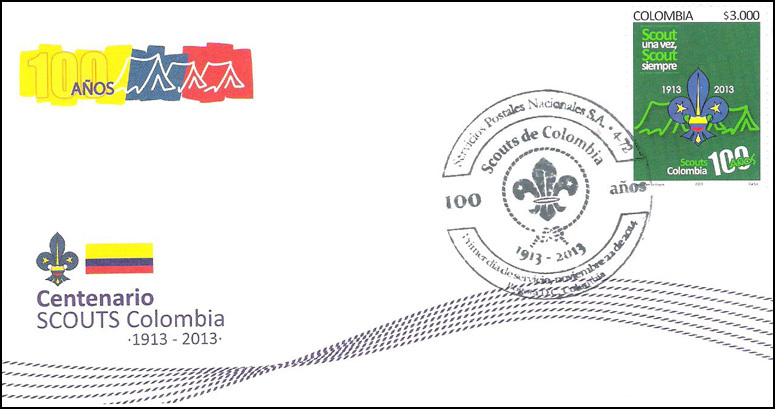 Sr. Duarte was one of the founding fathers of the Dominican Republic. 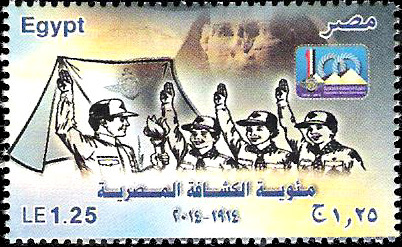 Single for Centenary of Egyptian Scouting featuring "100," pyramids and Scout badge. 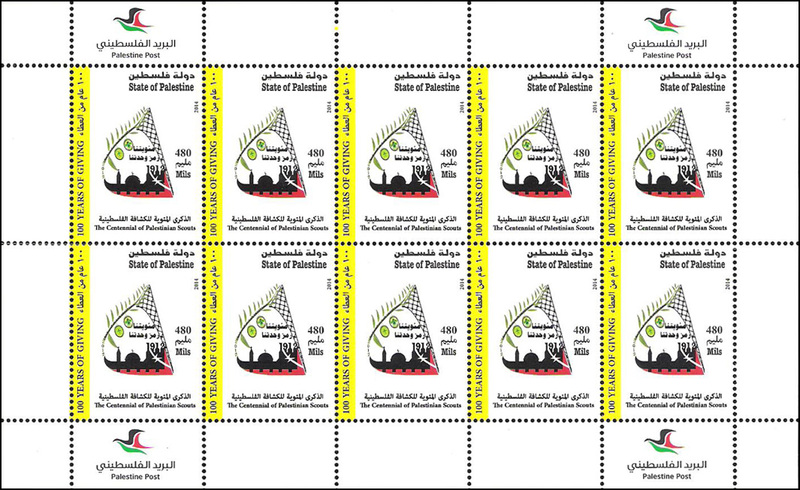 Set of 2 stamps printed in sheets of 8 stamps. 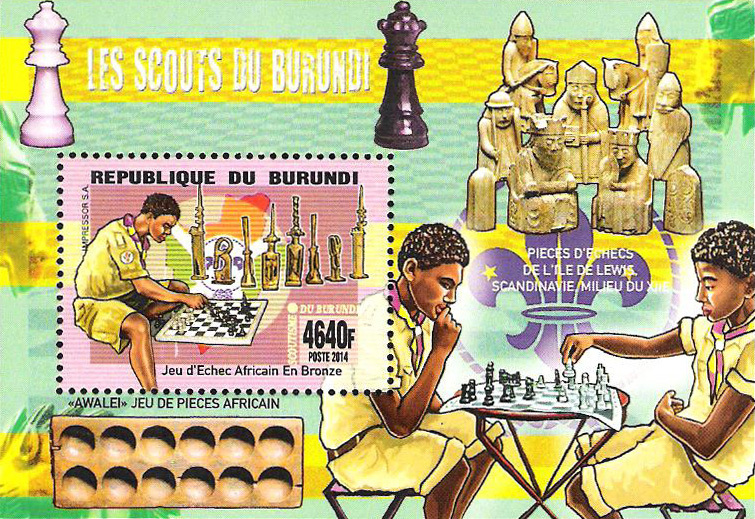 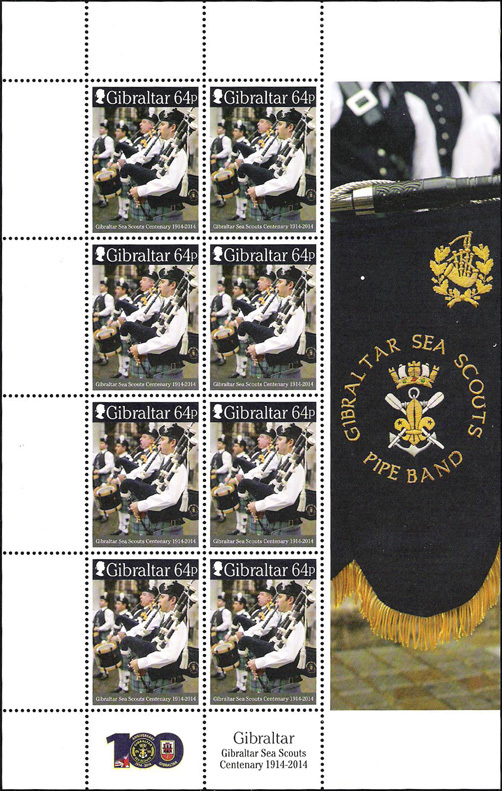 The 64p stamp shows close-up of some band members while the 40p stamp shows the entire Sea Scout band. 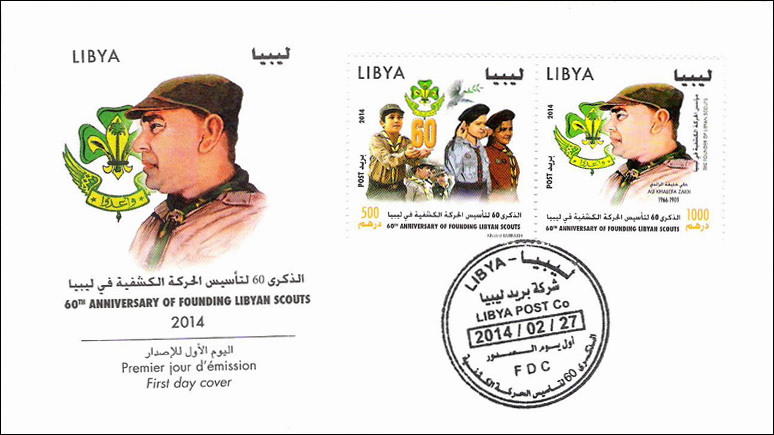 Pair of stamps, both with Libyan Scout badge; 500 dinar value depicting Scouts while the 1000 dinar value depicts Ali Khalefa Zaidi, former Chief Commissioner of Libya Public Scout and Guide Movement who was awarded Bronze Wolf in 1966. 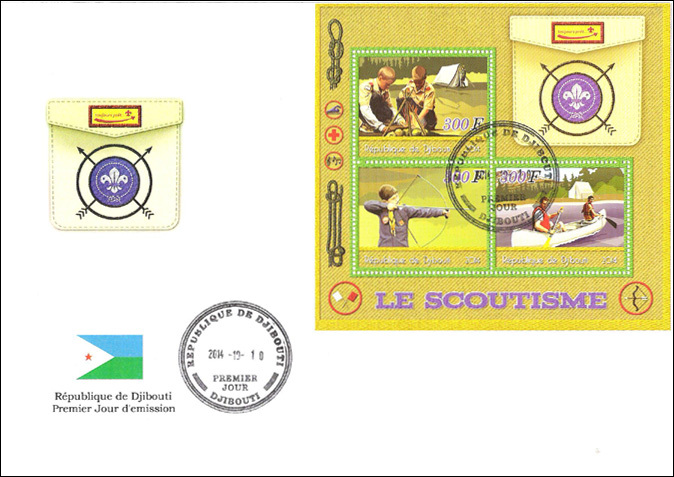 Set of 3 stamps for UNICEF International Children's Day (One stamp depicting saluting Scout in front of a tent - 250 dinar; a second stamp depicting what appears to be a Scout with butterflies in his hands - 1000 dinar. 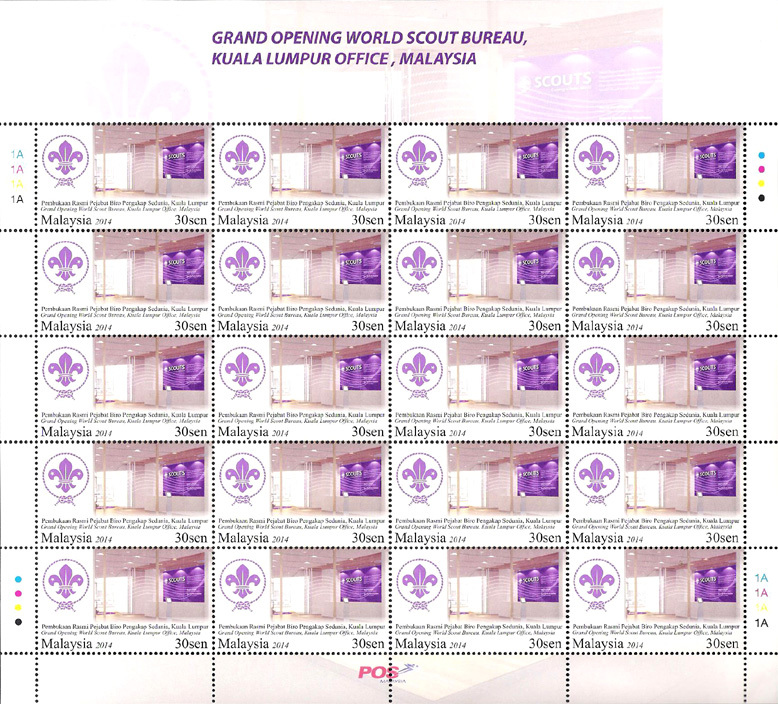 Set of three stamps for the grand opening of the offices of the World Scout Bureau (WSB) on 18 June 2014 in the Sentral Vista building in Brickfield, Kuala Lumpur, Malaysia. 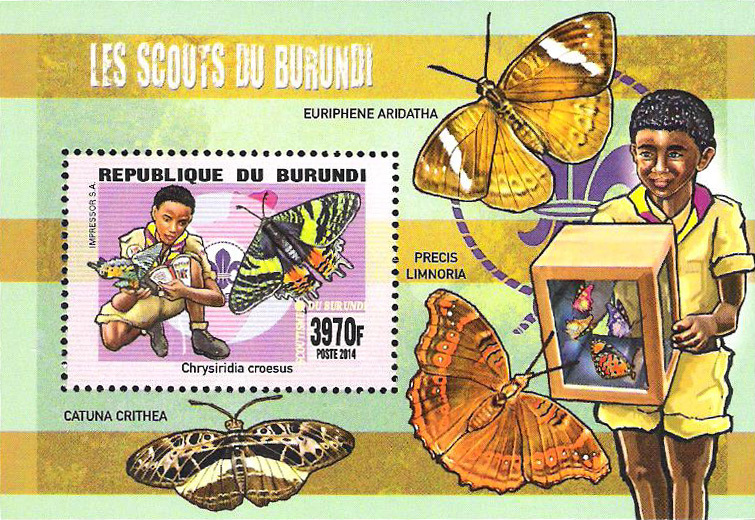 The WSB had been located in Geneva, Switzerland from 1968. 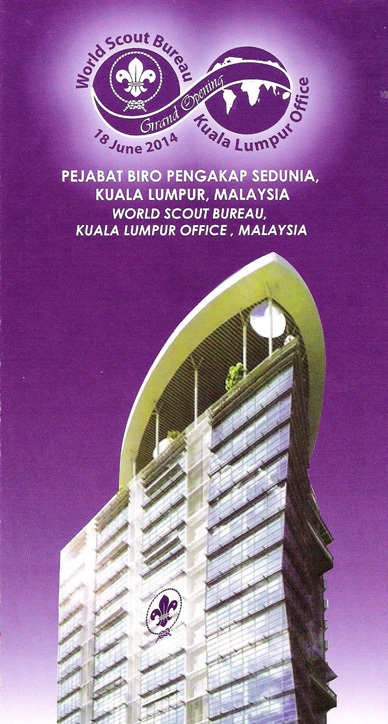 The 30 sen stamp depicts an external view of the offices on the 17th floor. 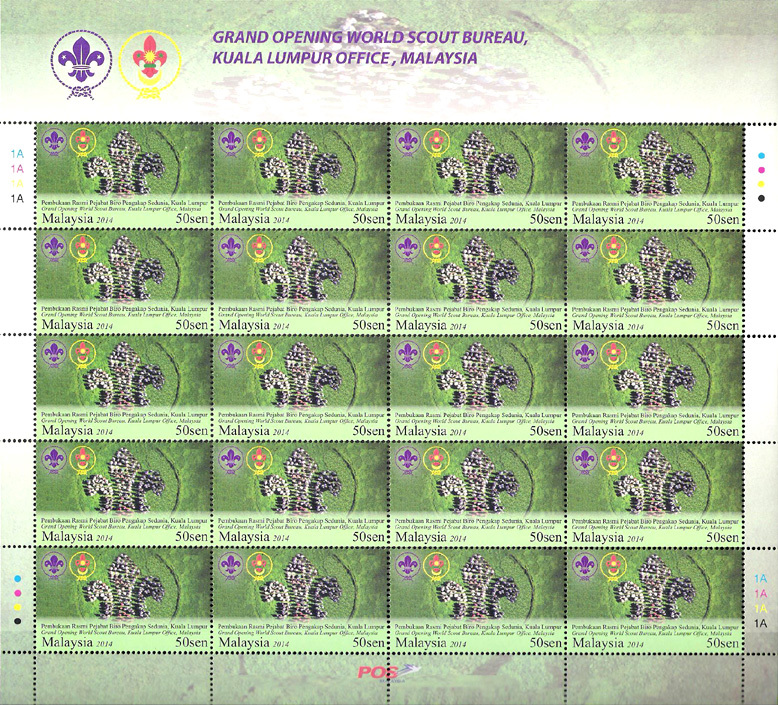 The 50 sen stamp shows a stylized fleur-de-lis to be formed by attendees for the opening. 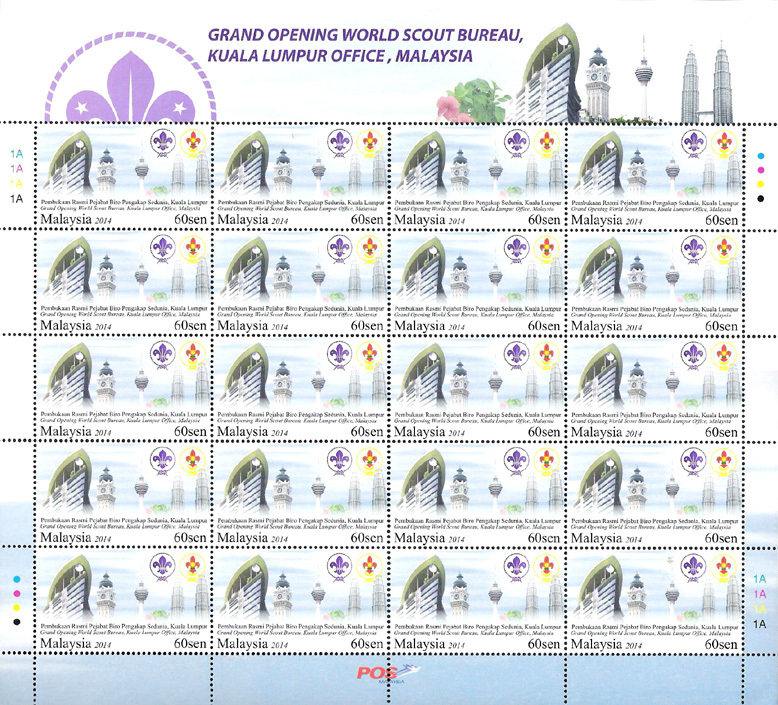 The 60 sen stamp shows the Sentral building on the left of the skyline of Kuala Lumpur. 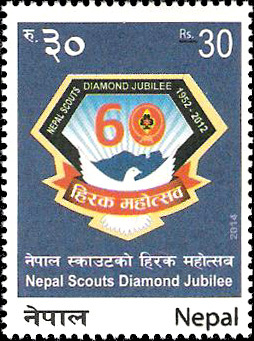 Single stamp celebrating the Diamond Jubilee of Scouting in Nepal. 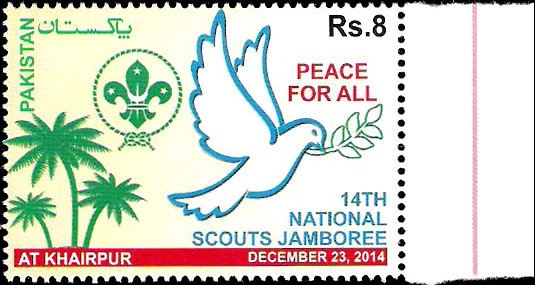 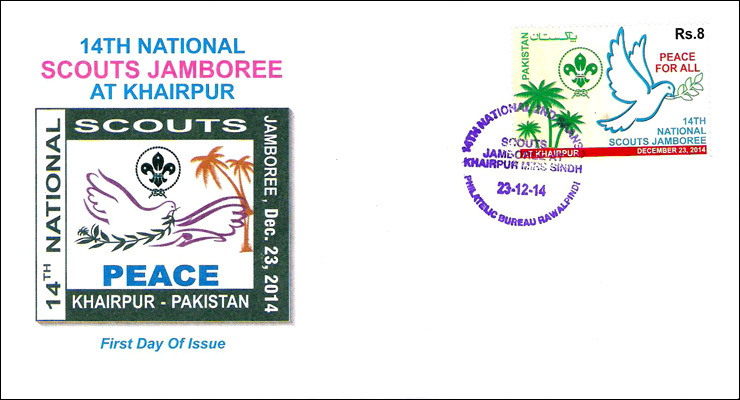 PEACE stamp with dove issued in sheets of 16 for the 2nd SAANSO and 14th National Scout Jamboree held at Naaz High School, Khairpur Mirs, Sindh from 16 - 23 December 2014. 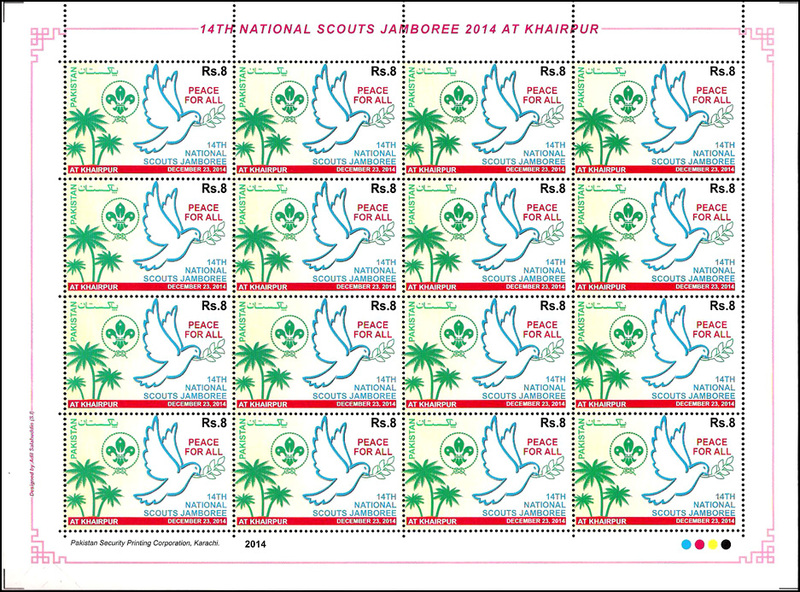 Value: 8 Rs. 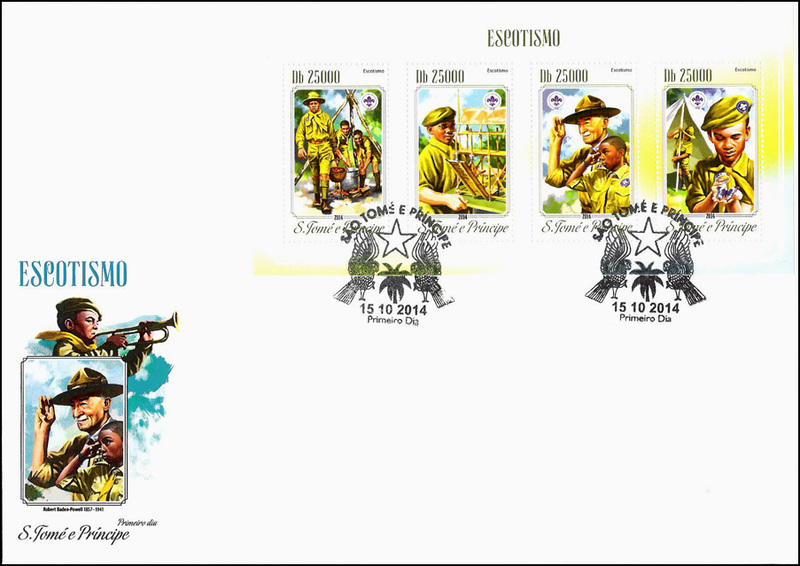 A se tenant pair of Panama stamps issued on 7 September 2000 for the 85th anniversary of the panama Canal (in 1999) were overprinted in 2014 commemorating two events - the stamp showing Canal builders and a crane on train trestle was overprinted and surcharged for the Panama Canal 100 Years of Service to Humanity while the stamp showing partially built structures and construction equipment was overprinted and surcharged for the "Centenario Movimiento Scout De Panama 1914 - 2014." 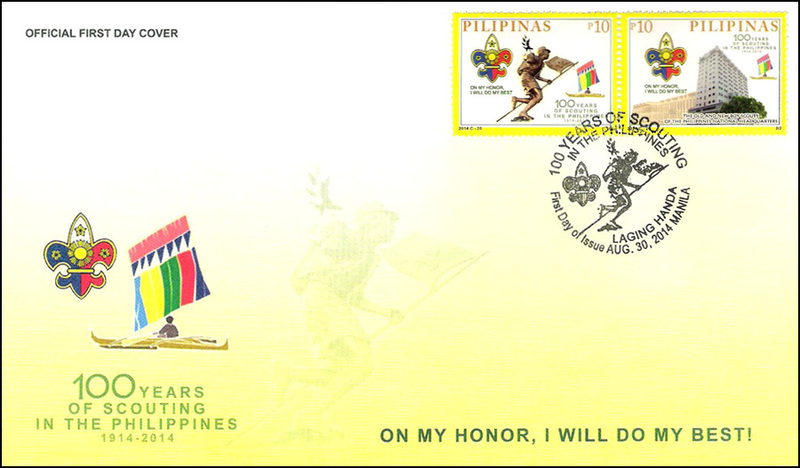 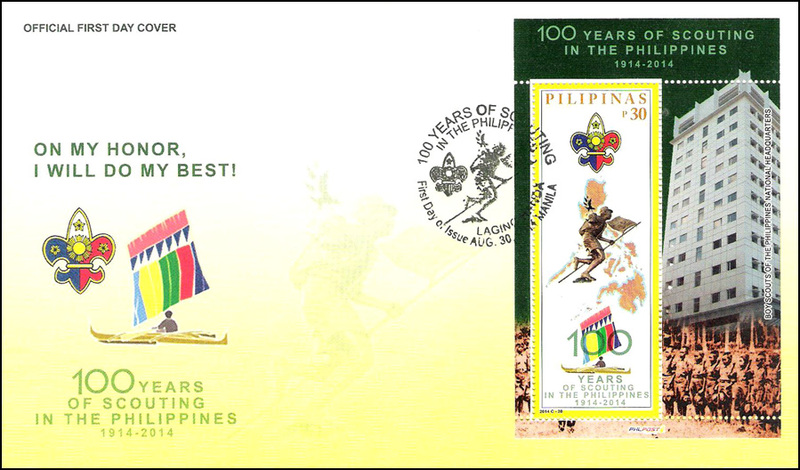 Set of two se tenant stamps plus SS issued for the 100th anniversary of Scouts in the Philippines. 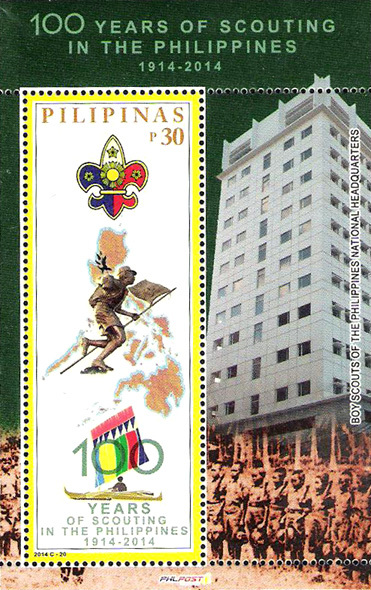 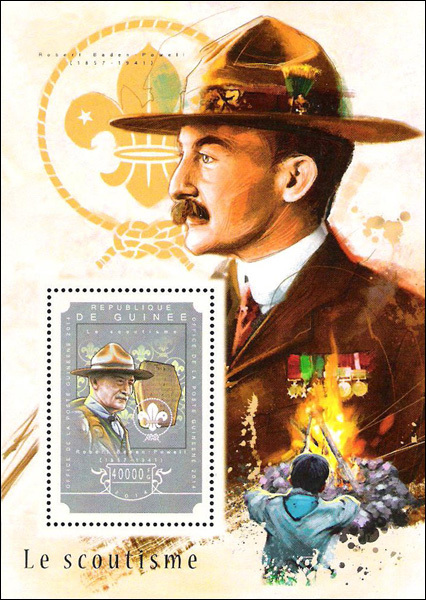 One stamp contains the Scout logo and centennial log and Boy Scout in Action Monument while second stamp in addition to logos shows the facade of the old BSP headquarters as well as the new headquarters building. 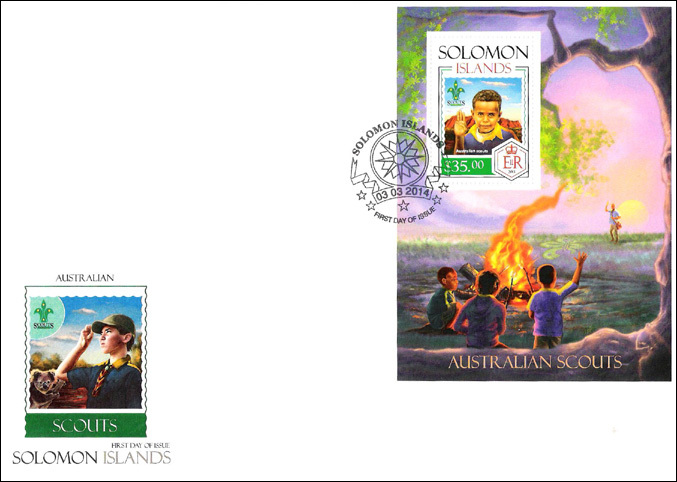 SS contains logos, Boy Scout in Action Monument and island map of Philippines. 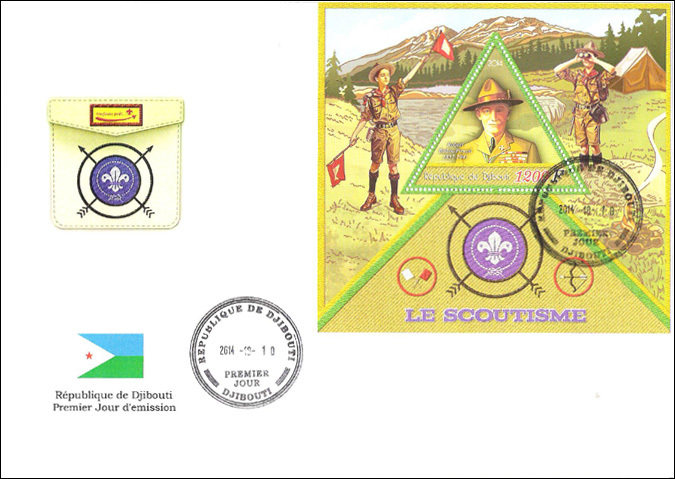 The new BSP headquarters with Scouts in front is in the selvage. 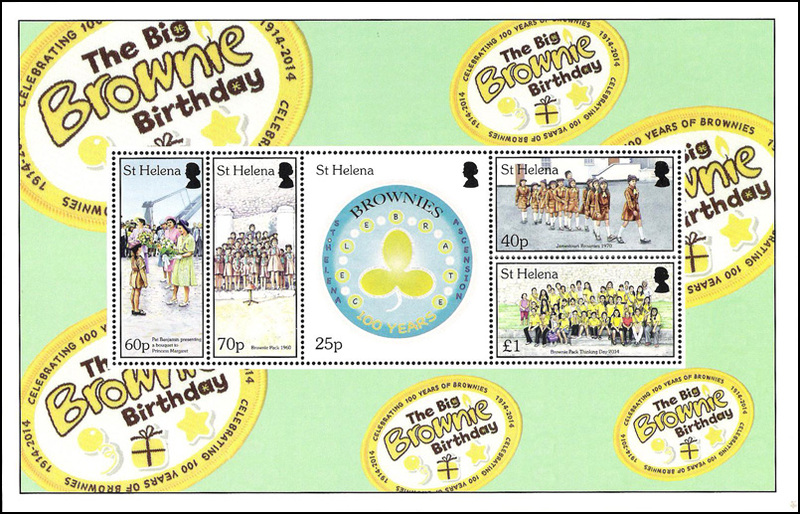 Designer - Nemesio "NEMI" Mirandi; Layout artist - Victorino Z. Serevo; Printer - Amstar Company, Inc.
MS of 5 for the Big Brownie Birthday (100m years) on St. Helena. 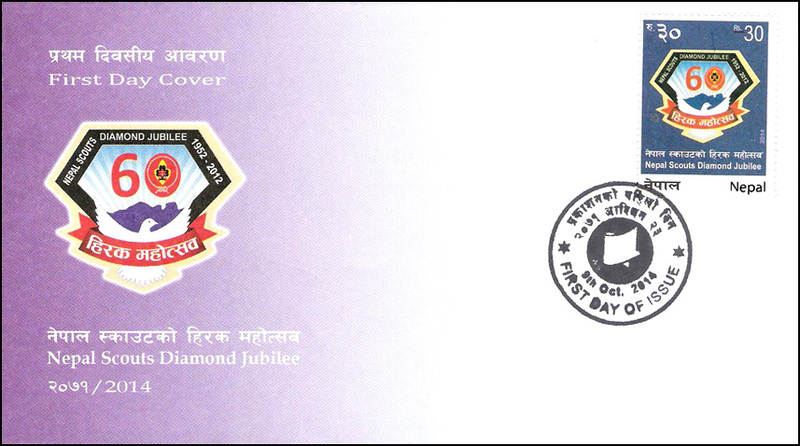 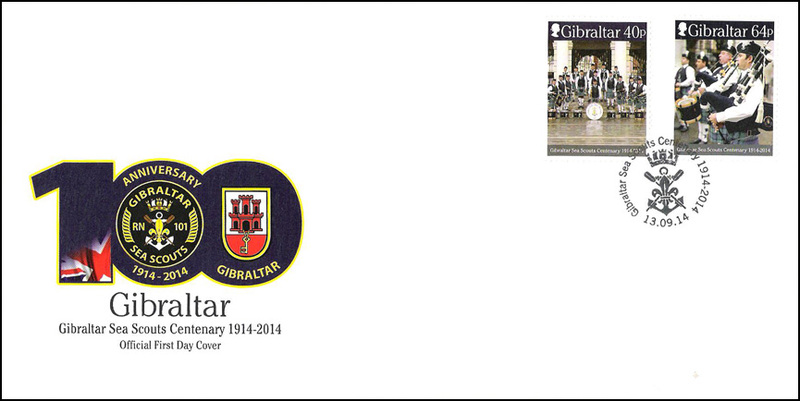 The 25p center stamp has the logo with "Celebrate 100 Years." 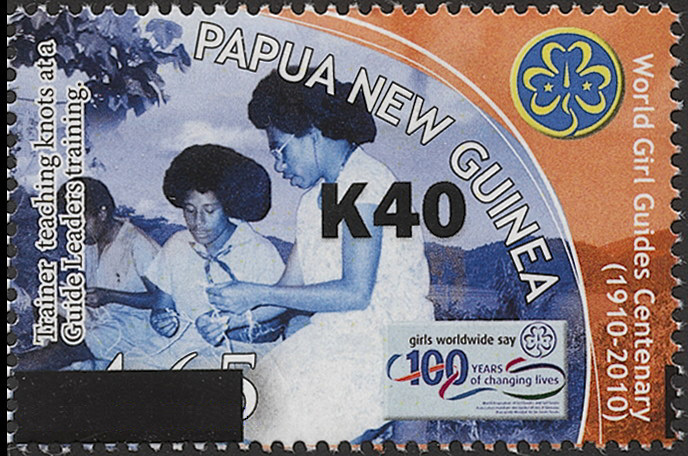 The 40p stamp shows the Jamestown Brownies 1970, the 60 p stamp shows Pat Benjamin presenting a bouquet to Princess Margaret during the visit of King George VI and his family in April 1947, the 70 p stamp pictures the Brownie Pack 1960 and the 1 Pound stamp pictures the Brownie Pack gathered for Girl Guide Thinking Day. 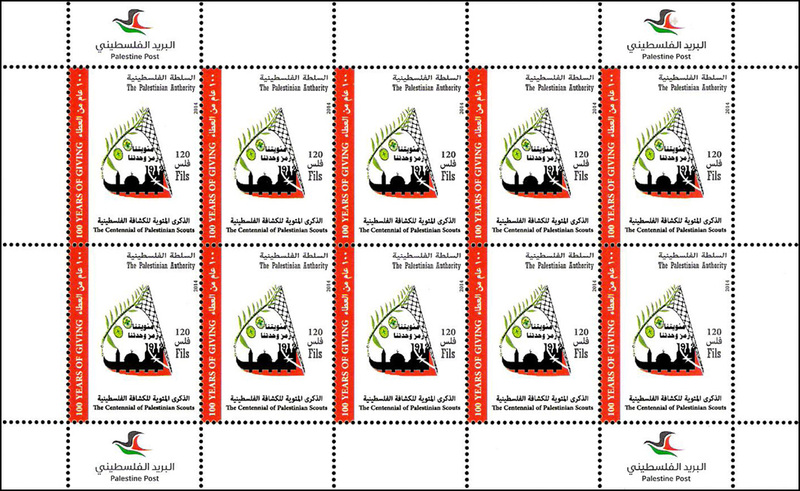 Single stamp issued in sheet of 6 with three labels as gutters. 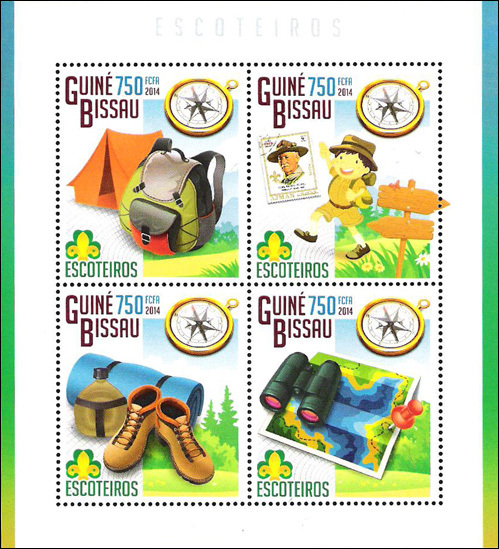 Stamp with cartoon type characters representing Scout activities including canoeing. 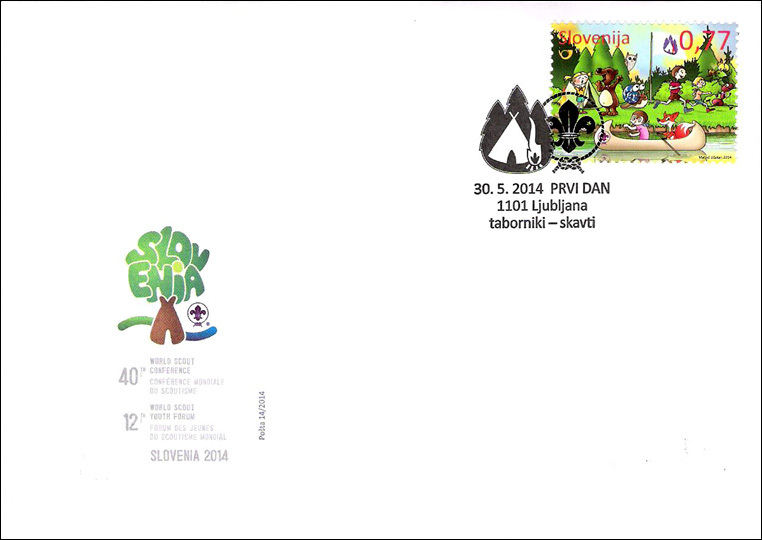 Issued for the upcoming 12th World Scout Youth Forum to be held at Rogla, Slovenia, on 4 - 7 August 2014, and the 40th World Scout Conference to be held at the Ljubljana Exhibition and Convention Centre on 11 - 14 August 2014. 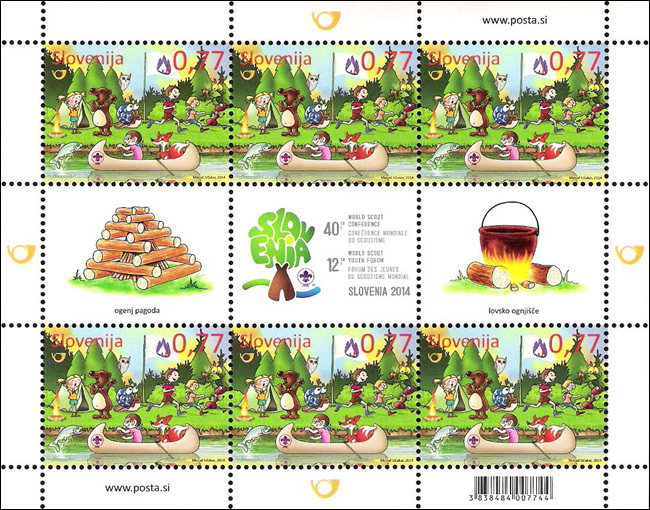 Sheets were printed by Postovni tiskarna cenin Praha a s. Value - 0.77 Euro per stamp. 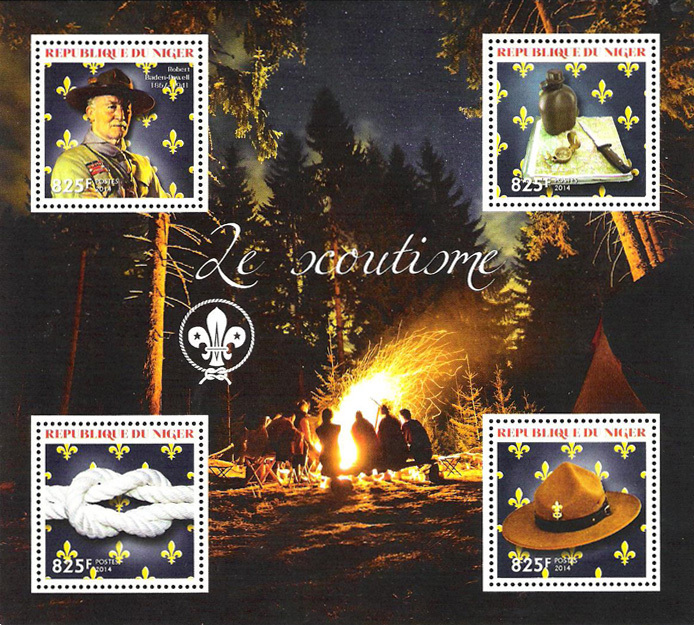 MS of 4 and SS (perf & imperf) recognizing Australian Scouts. 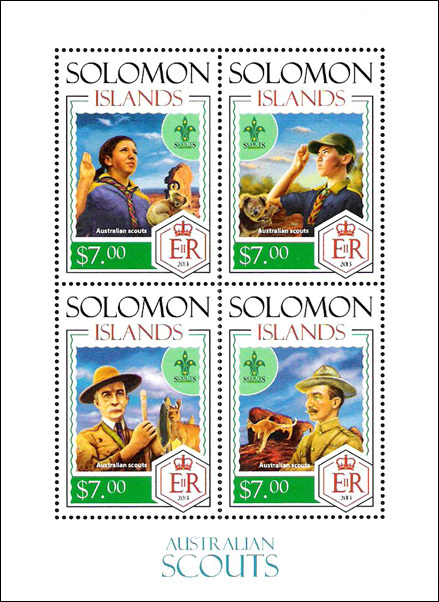 Each stamp includes a small Australian Scout badge. 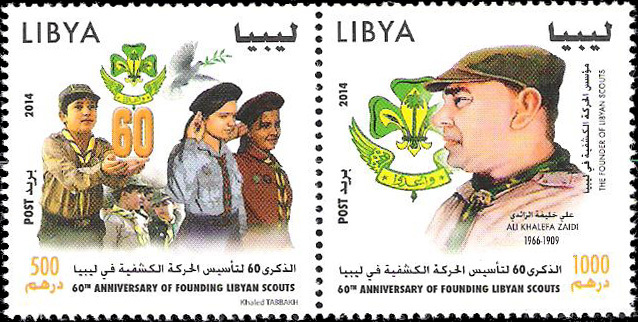 Two stamp in MS depict Baden-Powell and two have Scouts. 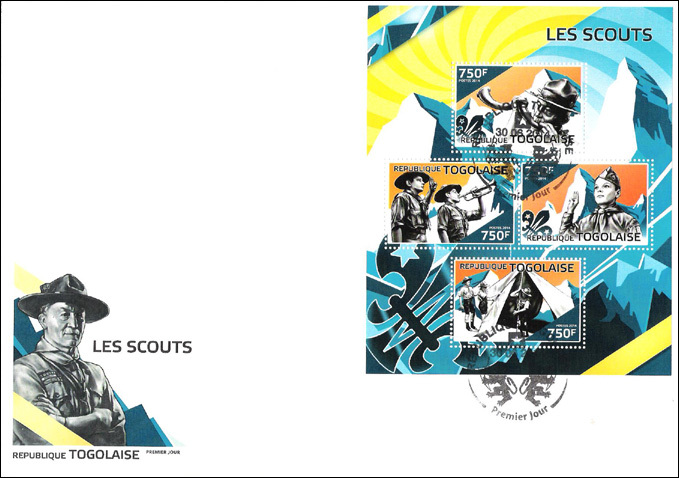 SS has Scout with Scout sign with big campfire in selvage. 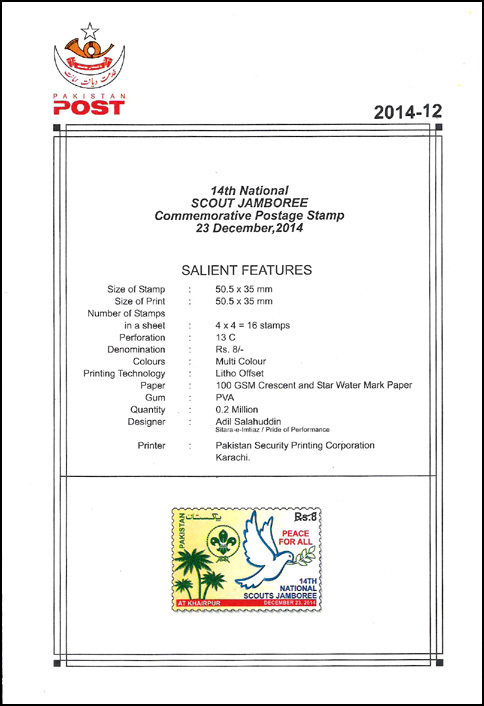 MS of 4 and SS (perf & imperf). 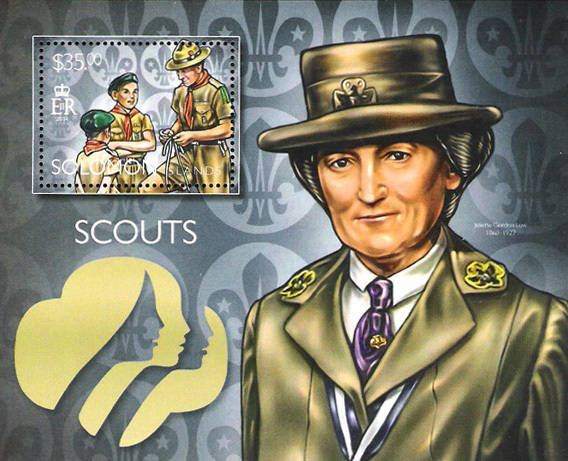 Issue jointly honors Lord Robert Baden-Powell, founder of World Scouting in 1907, and Juliette Gordon Low, Founder of the Girl Scouts of the USA in 1912. 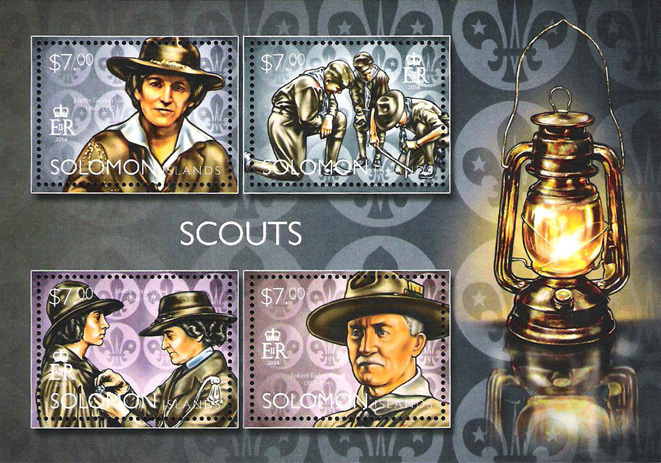 The lantern in the selvage is symbol for "leading the way" as these two individuals did. 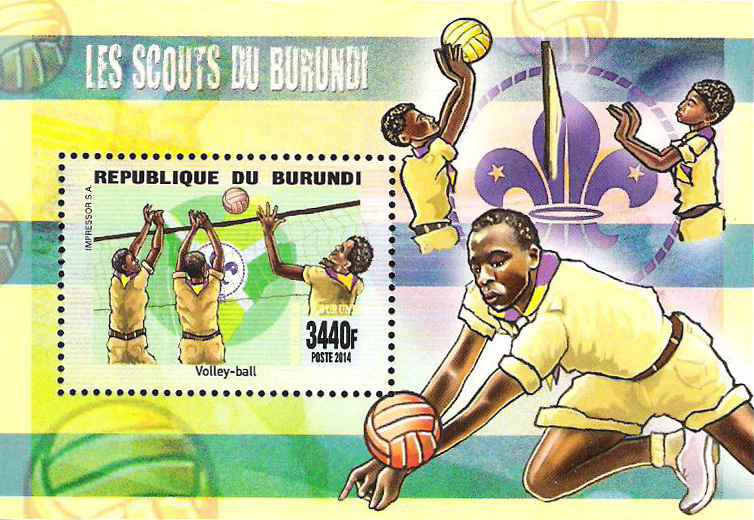 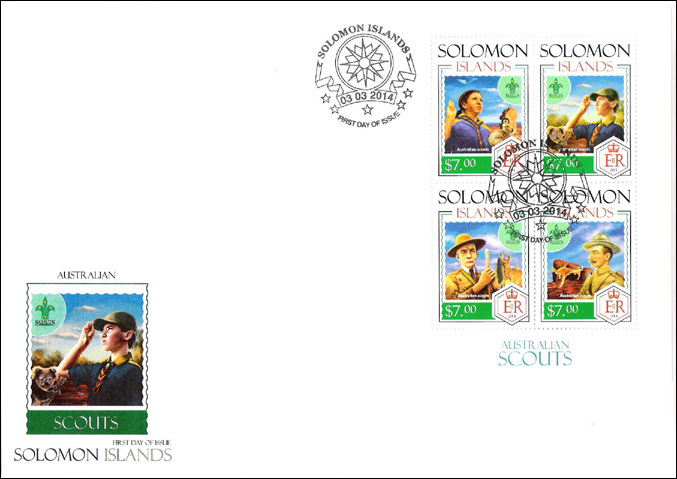 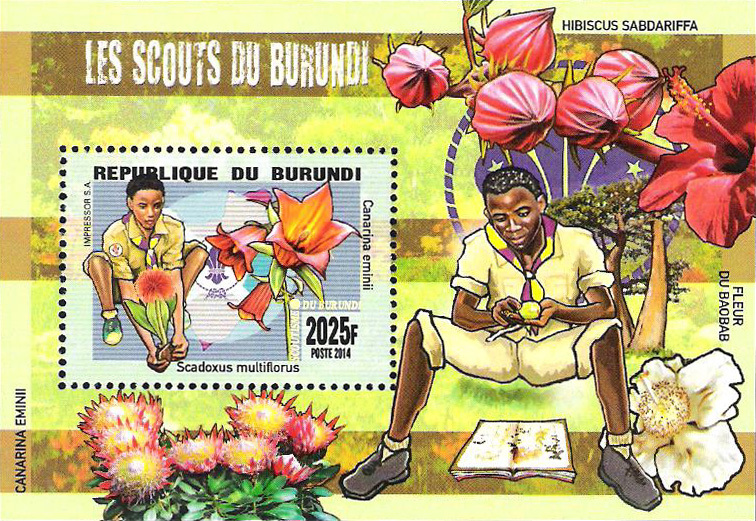 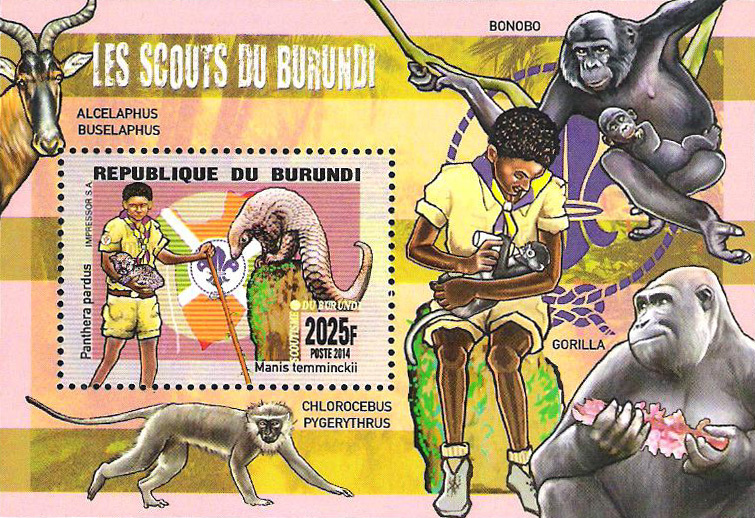 The MS depicts B-P in one stamp and Scouts in second while Mrs. Low is shown in one stamp and with Girl Scout in another. 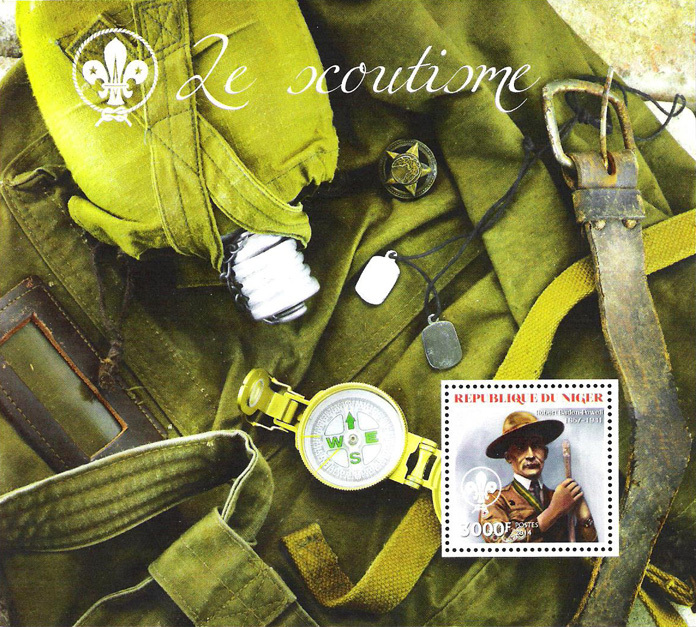 The SS has Scouts with knot-tying in the stamp and Juliette Gordon Low and Girl Scout logo in selvage. 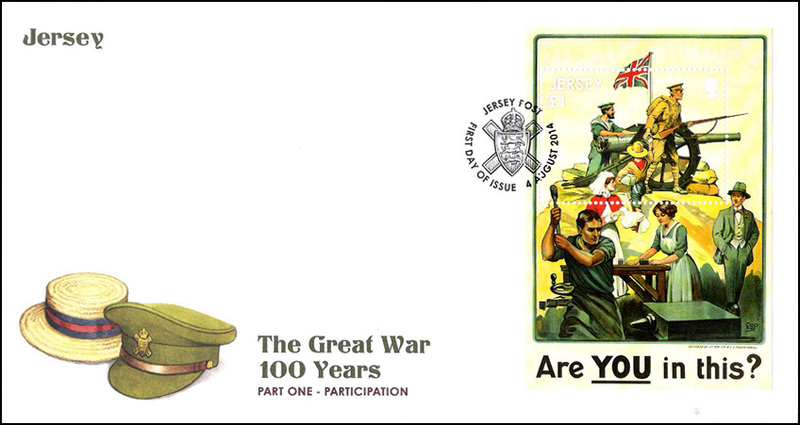 SS depicting large recruiting poster for World War I published by the Parliamentary Recruiting Committee in London, printed by Johnson, Riddle &n Co., Ltd., London SS early in WWI. 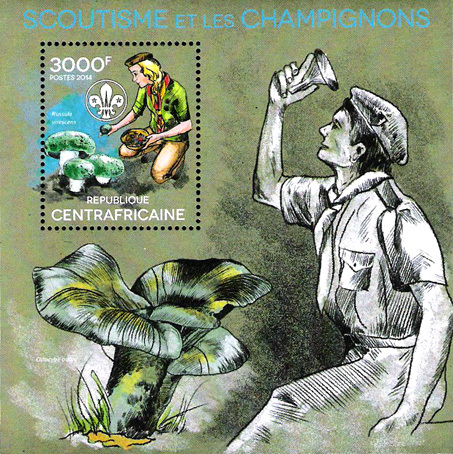 Poster was designed by Sir Robert Stephenson Baden-Powell. 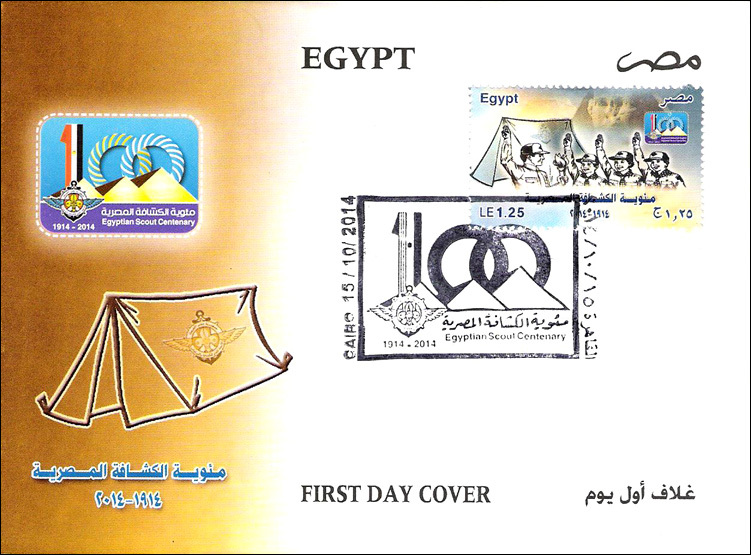 The theme of the poster is, "Are YOU in This?" 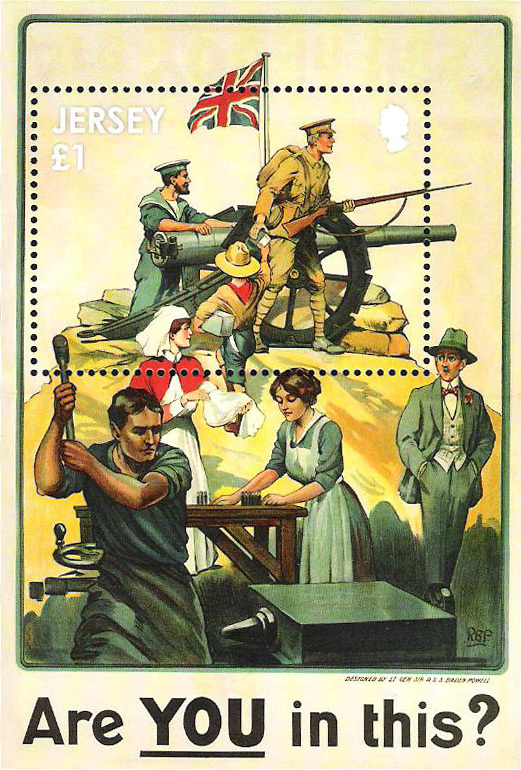 Design includes a soldier in khaki holding a rifle, Boy Scout carrying a box and note, sailor in blue manning a large gun, worker bearing a sledge hammer, a woman working on rows of bullets on a table, and an idle-looking man, hands in pocket, smoking a cigarette. 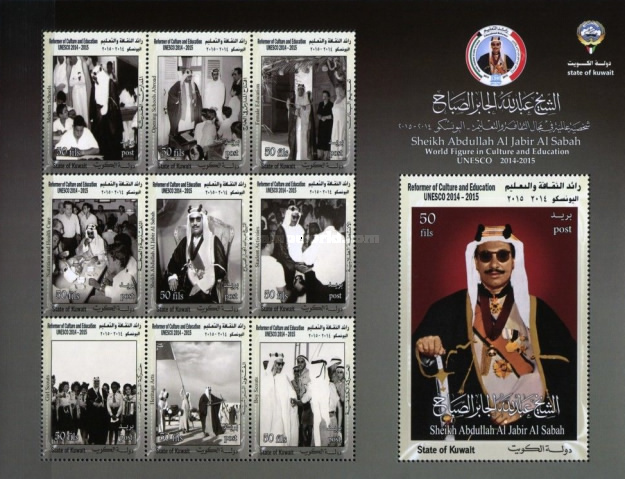 Minisheet of 10 featuring the Sheikh with several stamps showing the Sheikh with different cultural and educational visits in Kuwait. 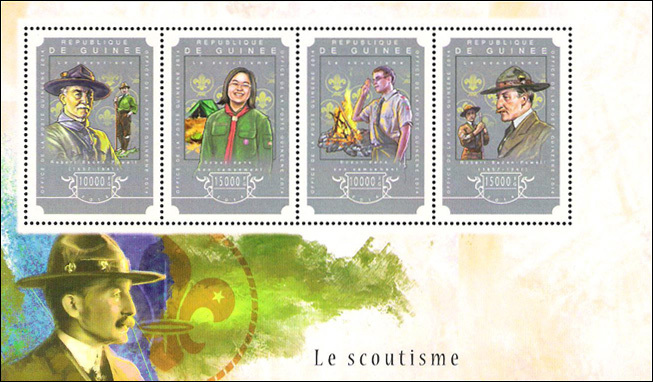 The bottom left shows him with a group of Girl Guides. 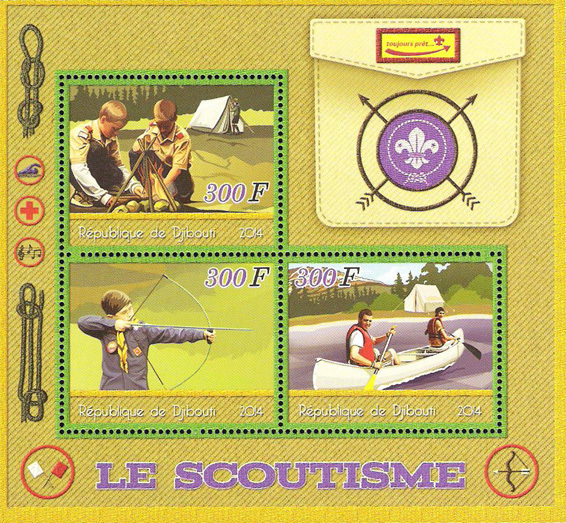 Two SSs, horizontal MS of 2 and vertical MS of 2 (perf & imperf). 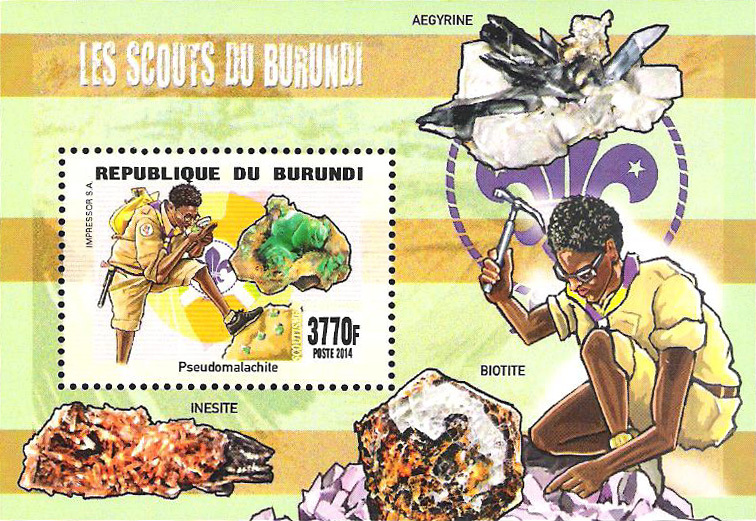 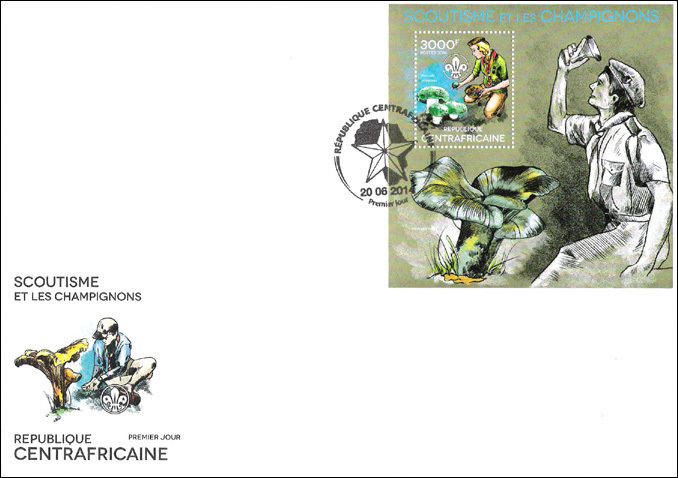 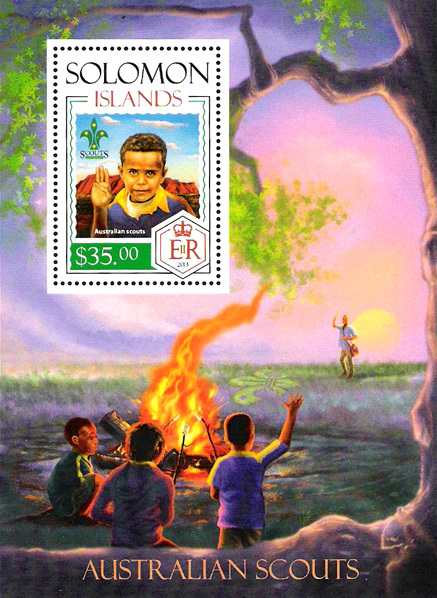 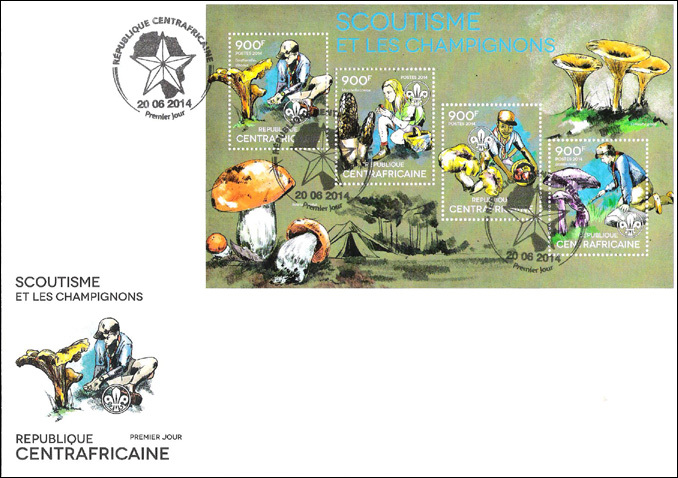 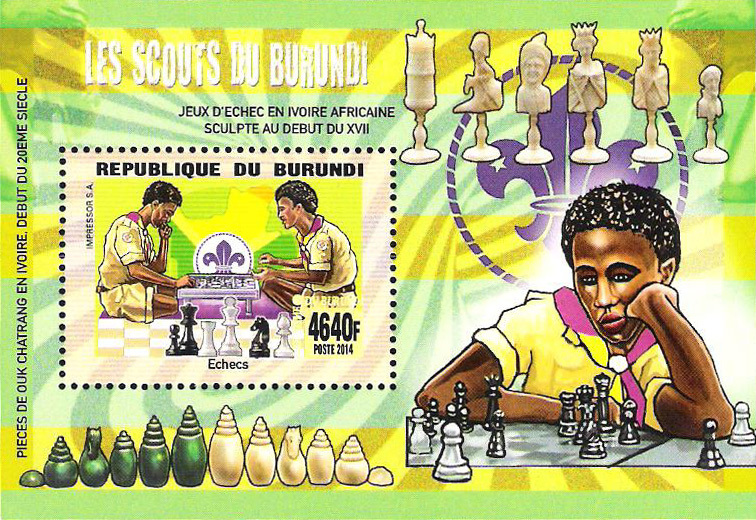 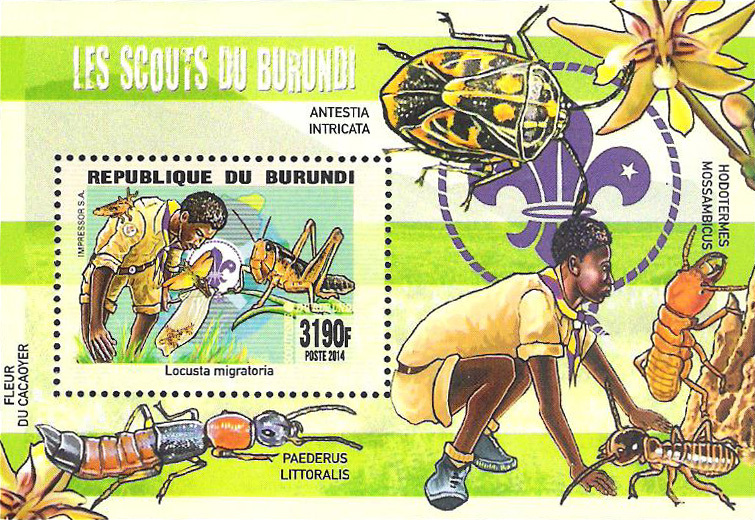 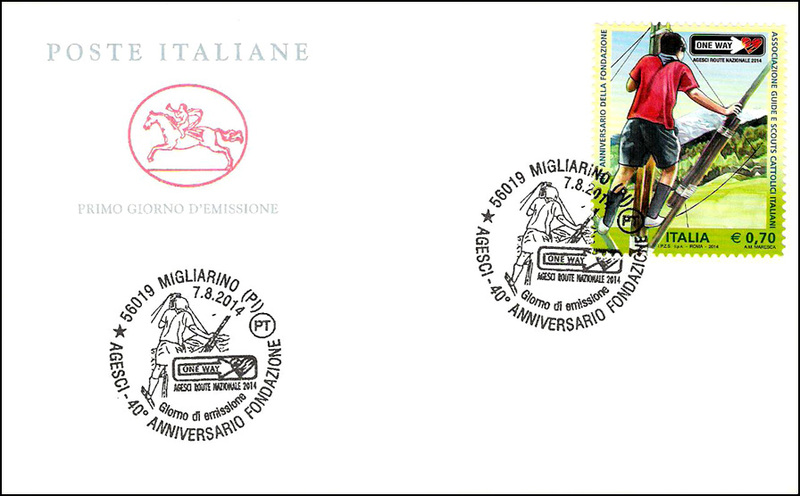 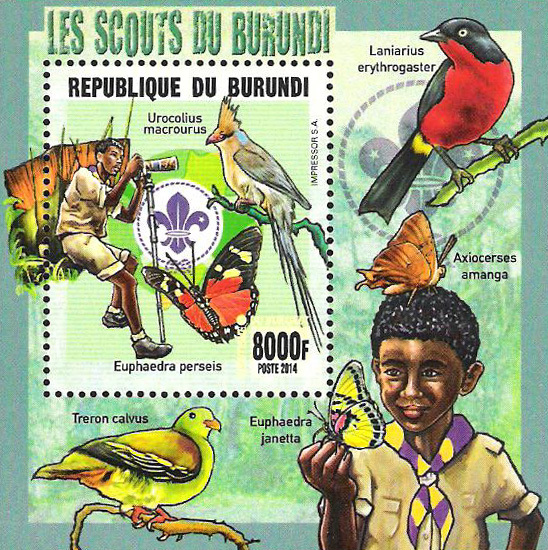 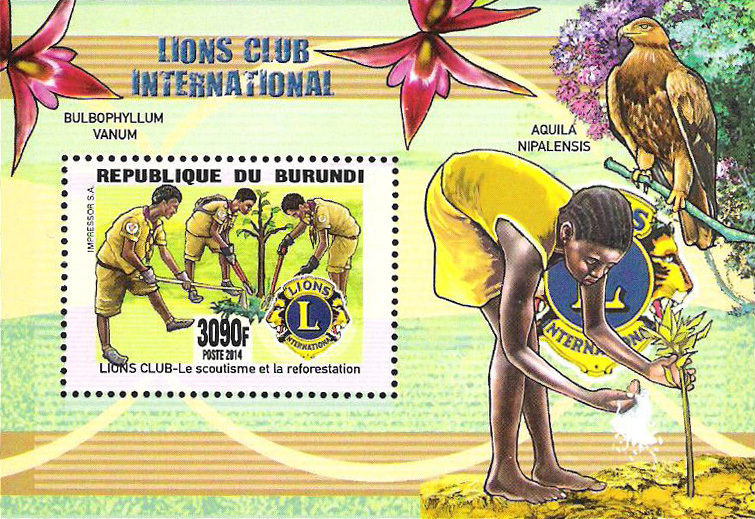 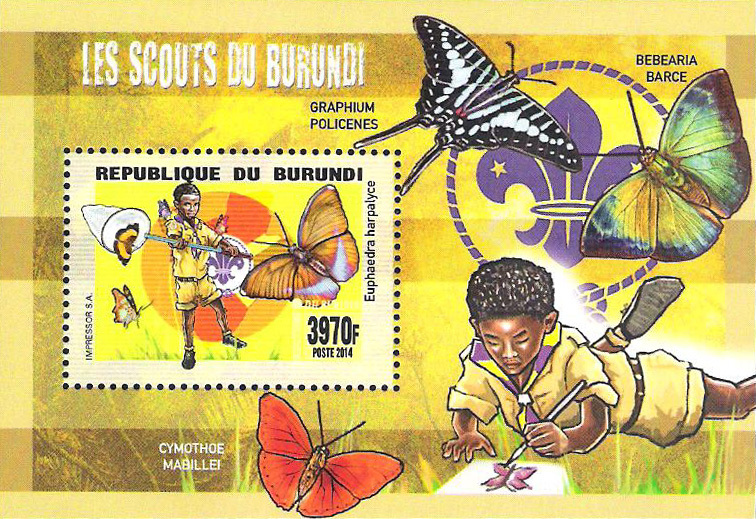 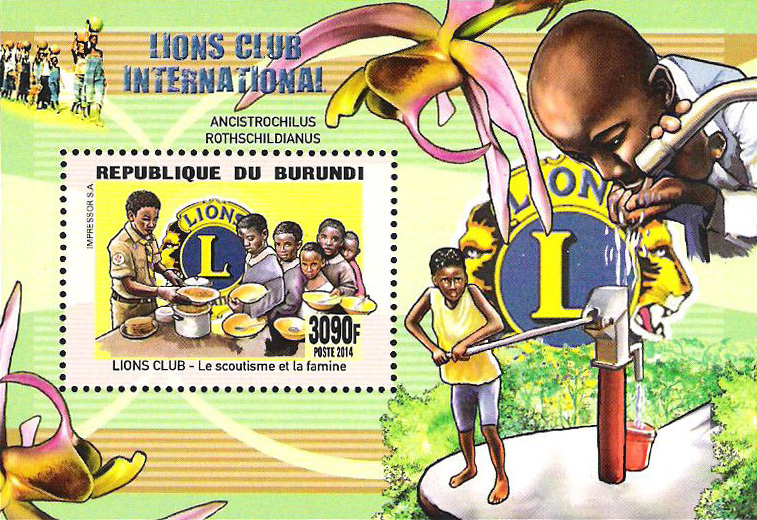 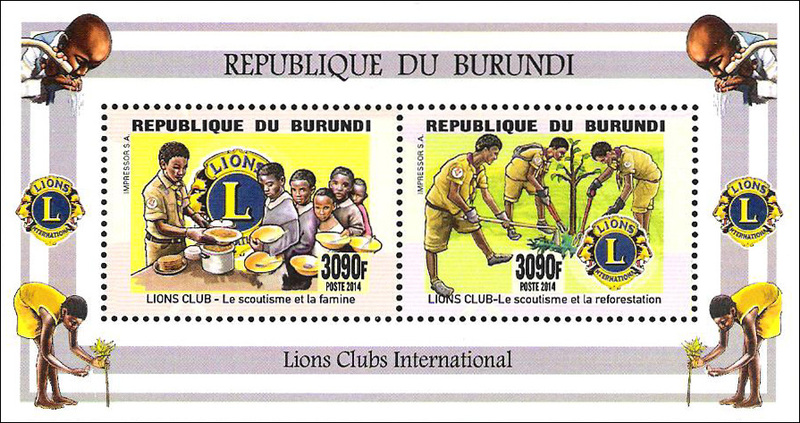 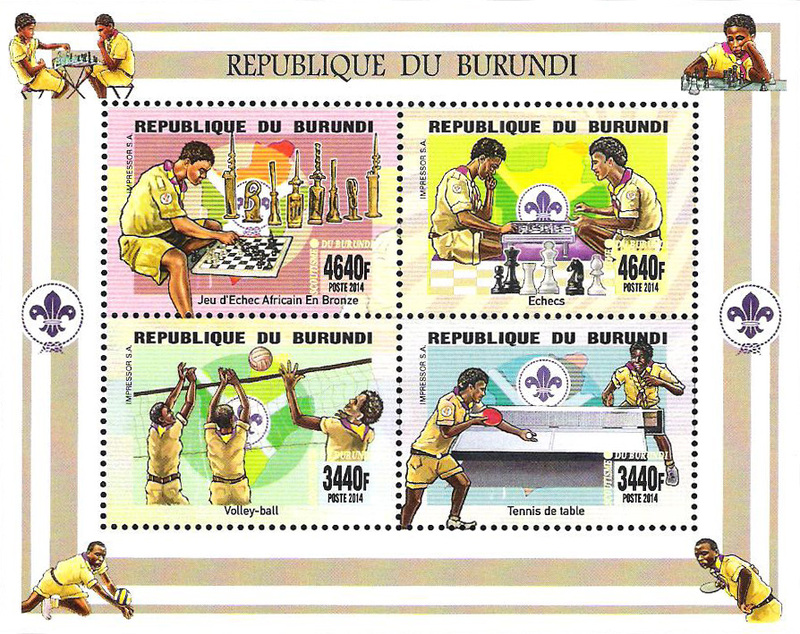 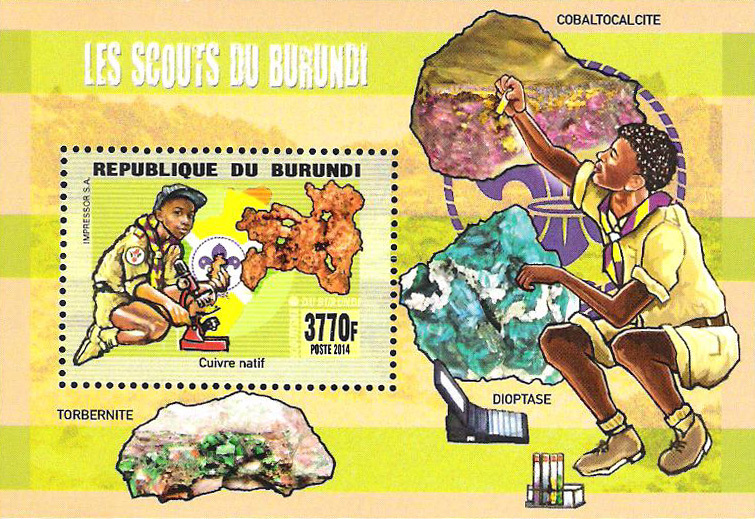 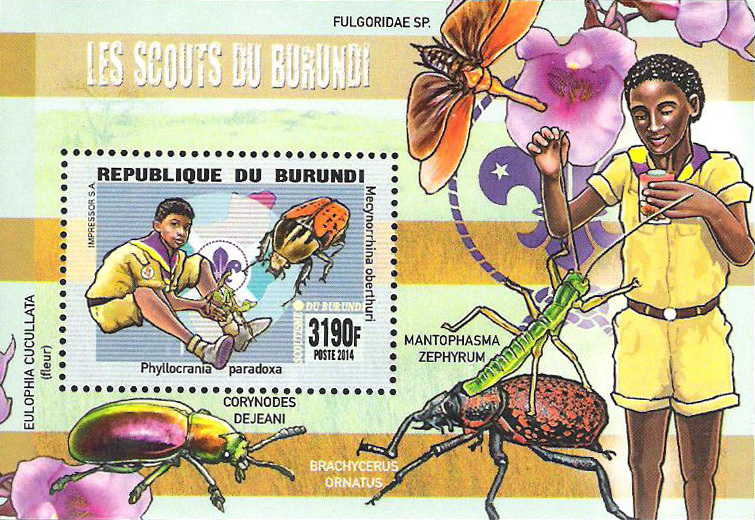 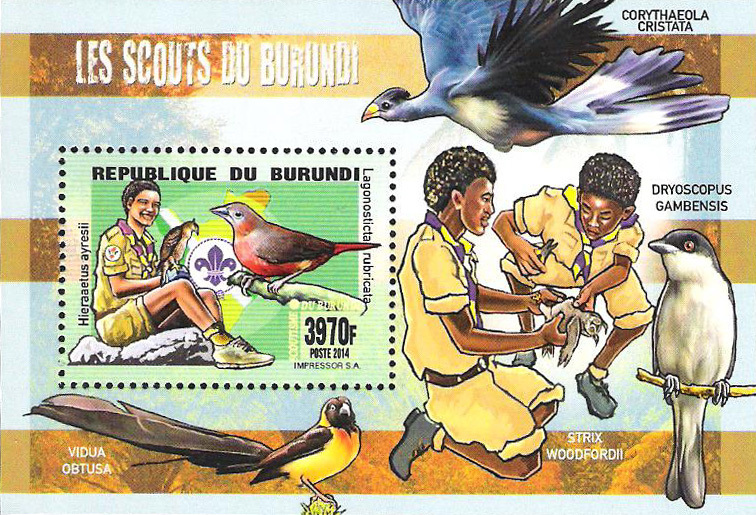 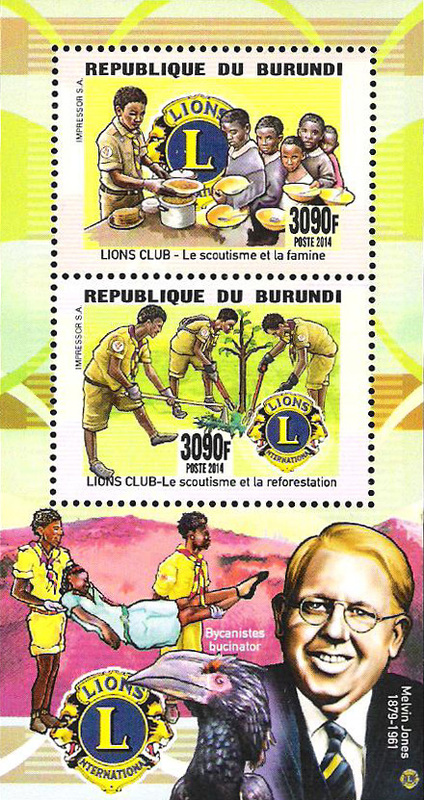 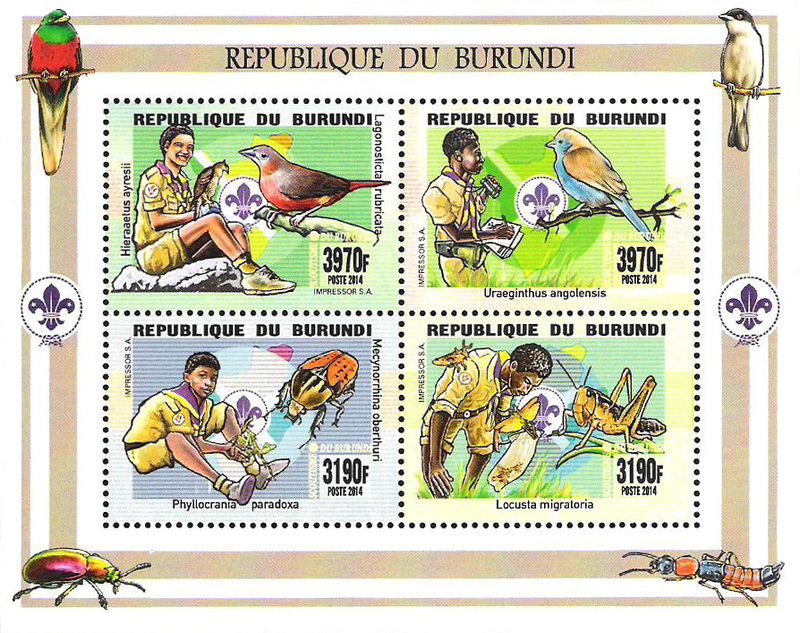 One stamp shows Scouts helping fight famine and doing reforestation in second stamp. 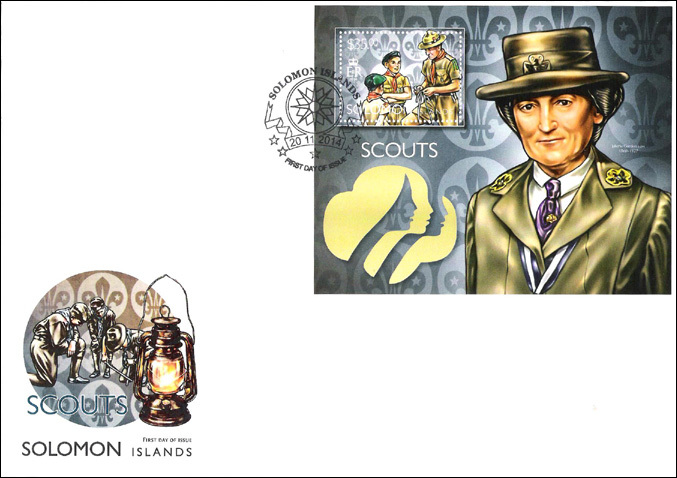 Melvyn Jones (1873 - 1961), founder of Lions Club International in 1917 and secretary-general of Lions from 1917 - 1961 is shown in selvage of vertical MS of 2. 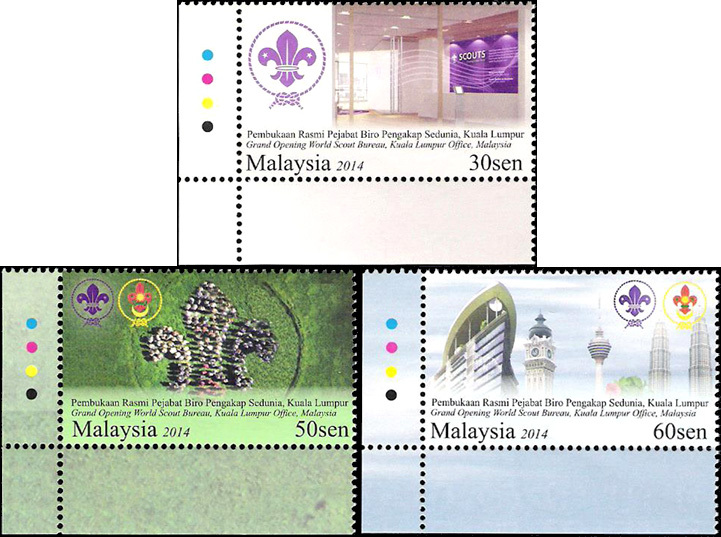 MS of 4 and SS (perf & imperf). 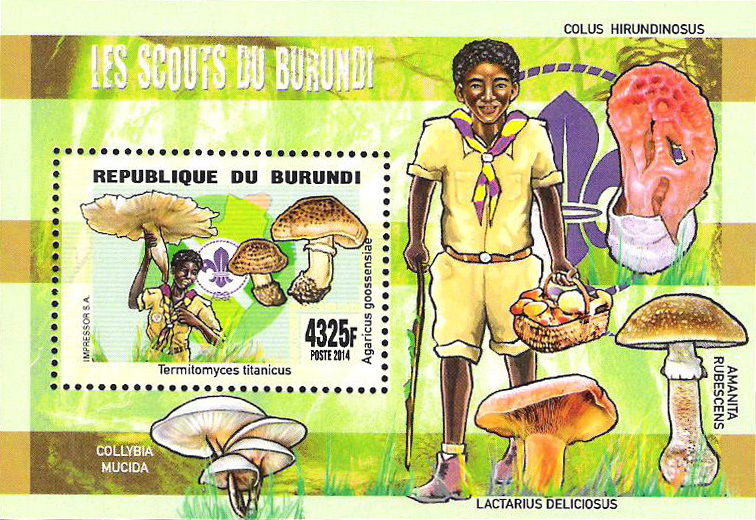 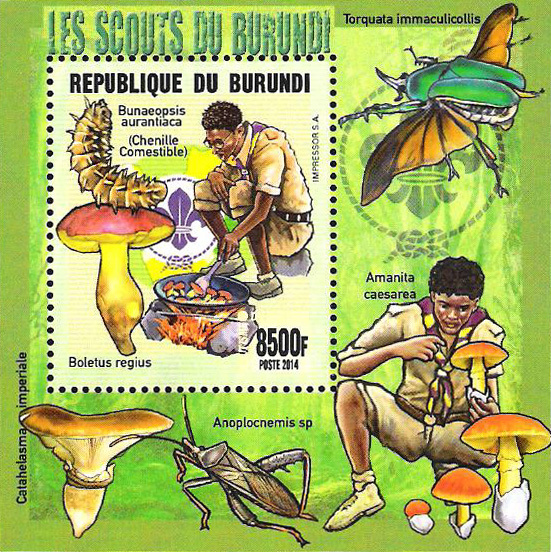 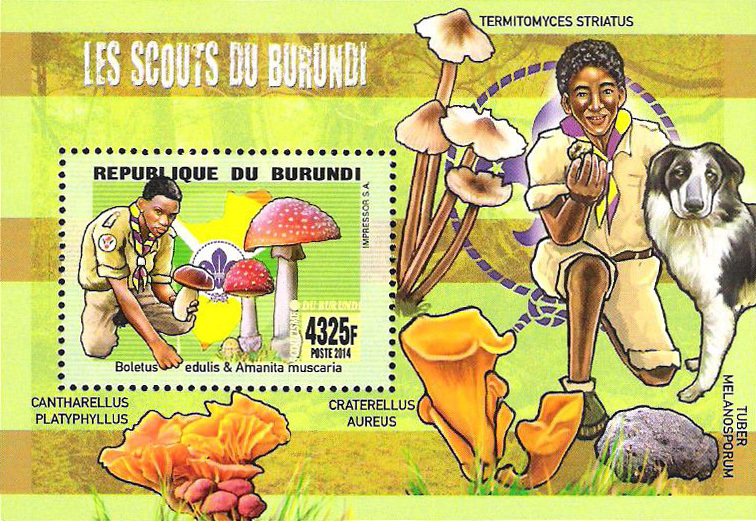 Scouts shown with various types of mushrooms. 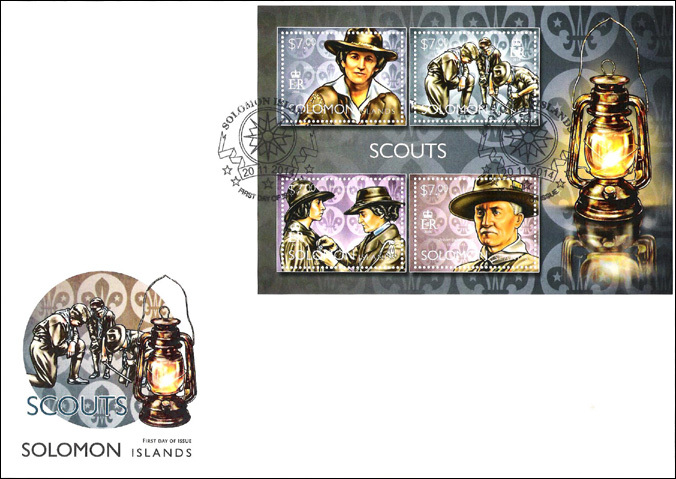 MS of 3 and SS (perf & imperf).Scout activities shown on MS while Baden-Powell is on SS flanked by Scout signaling and one with binoculars. 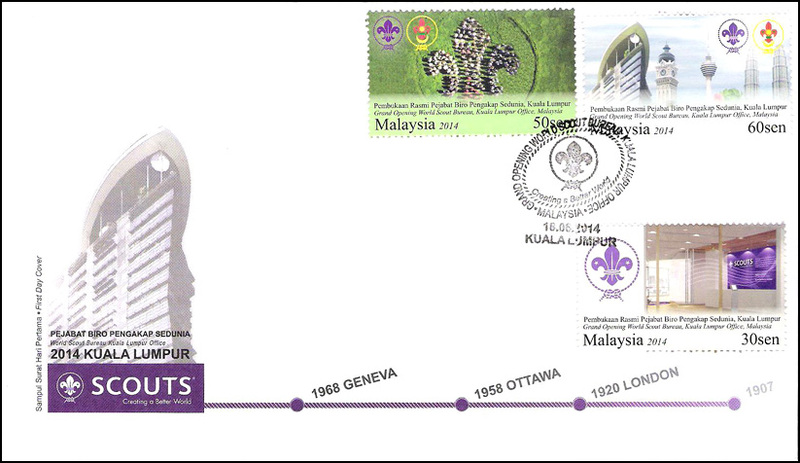 World Scout badge is prominent on MS and SS. 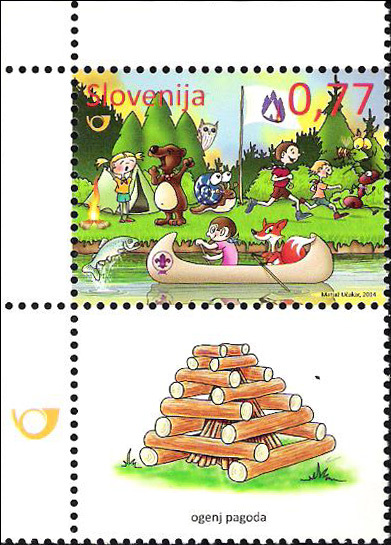 MS of 4 and SS (perf & imperf). 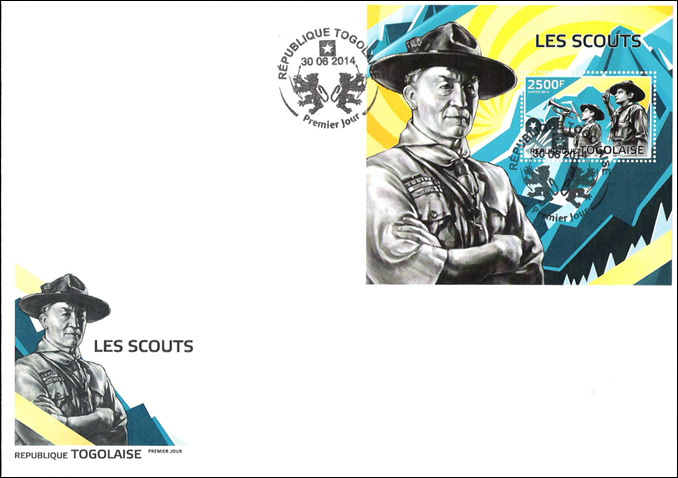 MS depicts Girl Scout and Boy Scout along with two images of Baden-Powell. 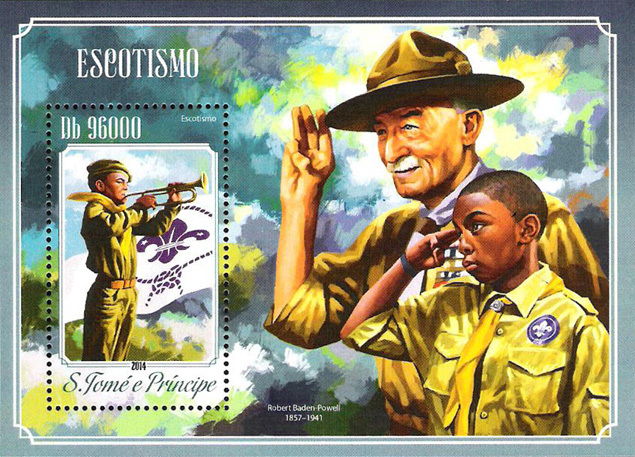 SS depicts Baden-Powell. 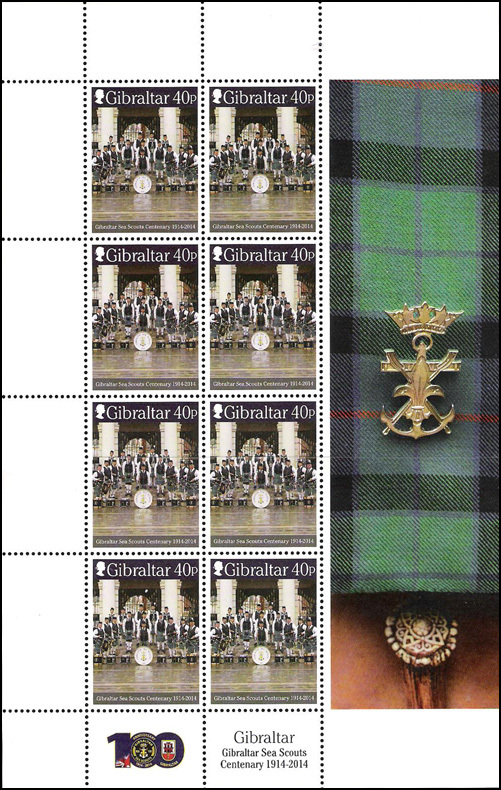 MS of 4 (perf & imperf). 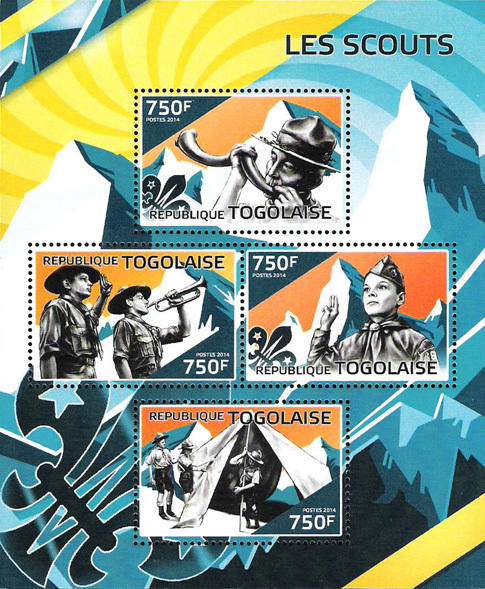 All four stamps depict a compass in upper right of stamp. 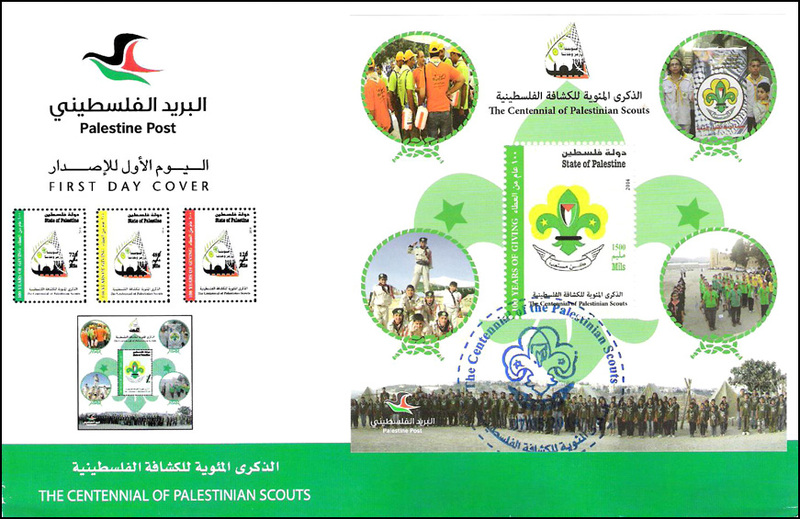 One stamp shows Scout and an image of the 1971 Ajman stamp showing Baden-Powell. 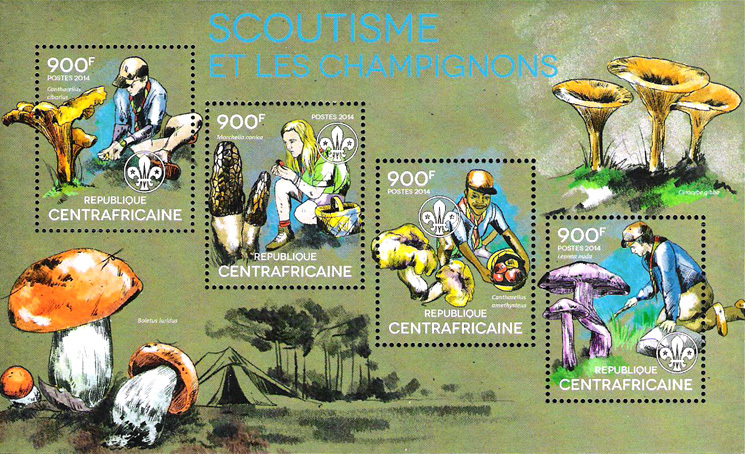 The other three stamps show items of Scouting equipment such as boots, bed roll, back pack, binoculars, tent, etc. 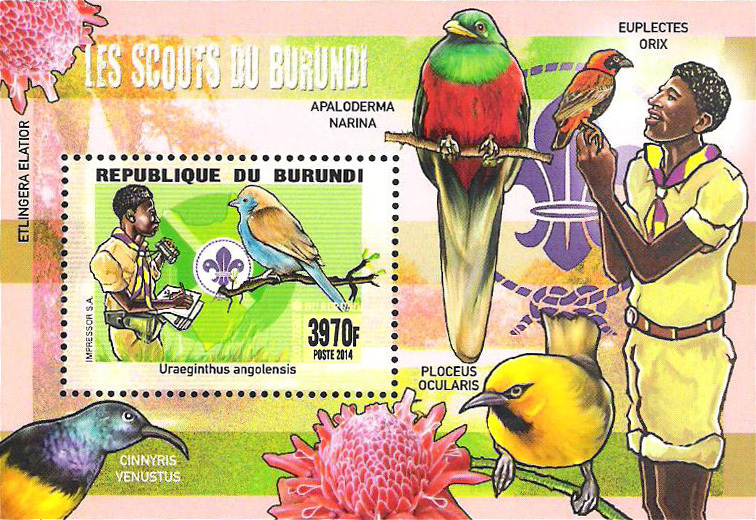 In 2014-5 Papua New Guinea issued 23 provisional stamps for local postal use only. 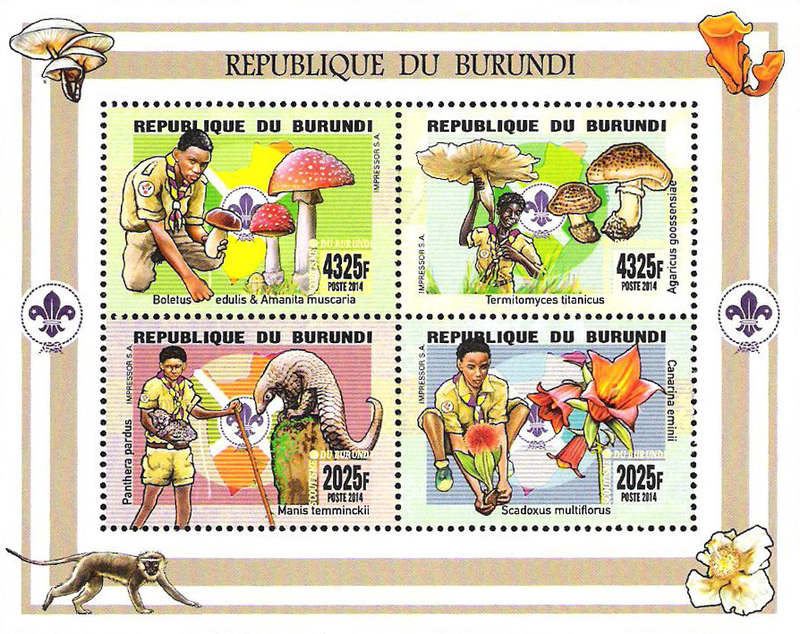 These stamps were overprinted in denominations of K1.30 to K90 with 1250 stamps printed of the K1.30 denomination and 500 of each denomination from K15 to K90. 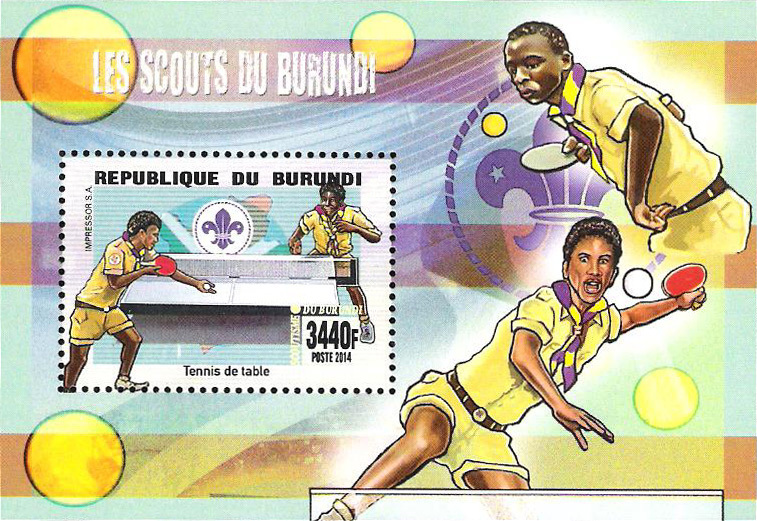 Two 2010 World Girl Guide stamps were overprinted. 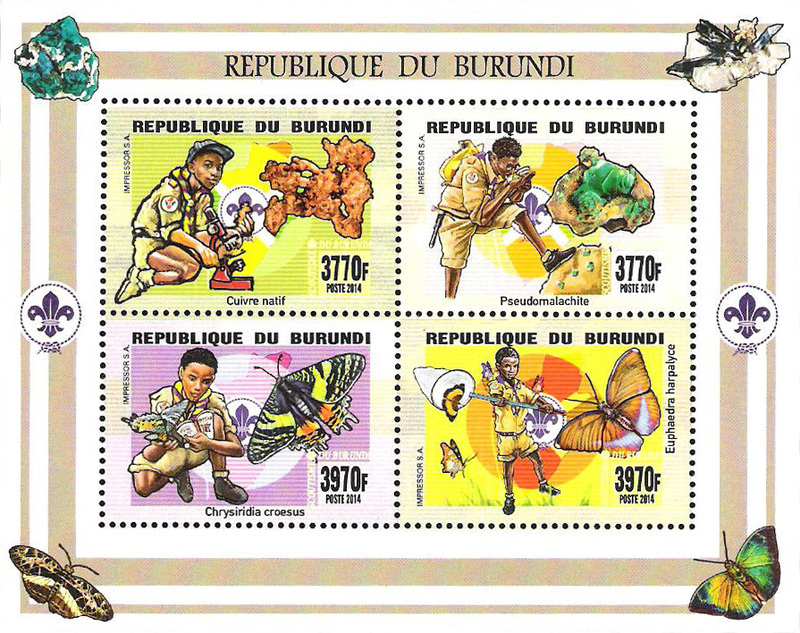 The K4.65 value stamp was overprinted and surcharged K40 and the K6.30 stamp to K90. 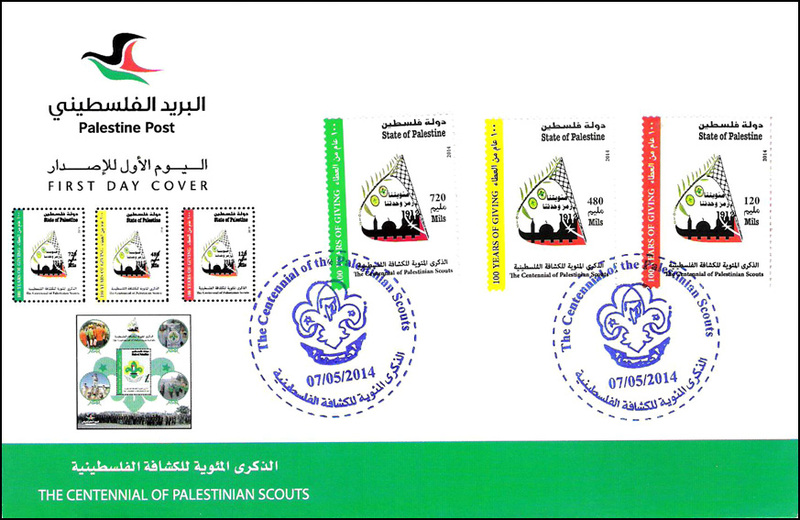 Set of 3 stamps issued in sheets of 10 and a SS by the State of Palestine for the Centennial of Palestinian Scouts. 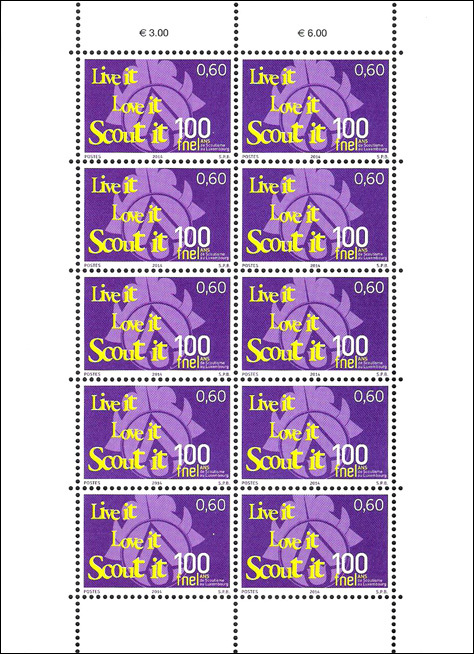 Stamps show the Scout movement logo. 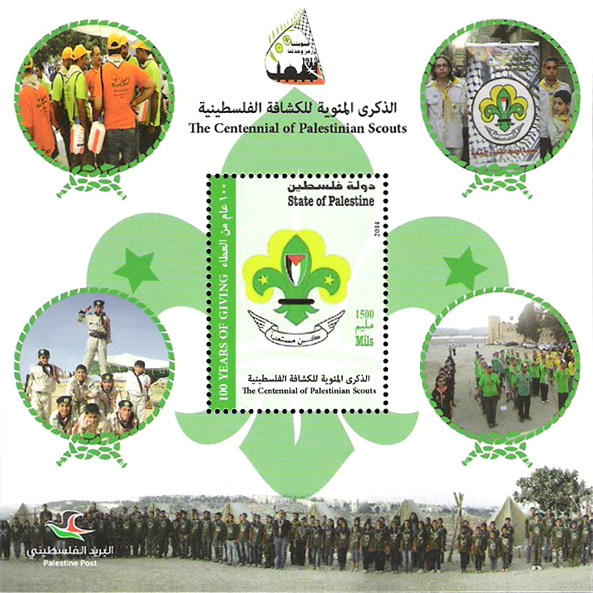 The SS features the Palestinian Scout badge with cameos of Scout activities. 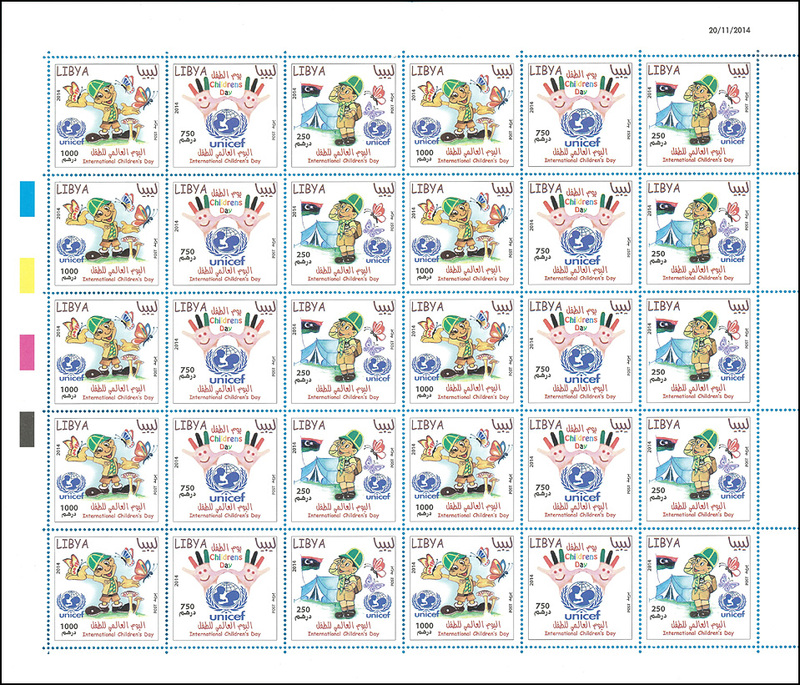 Values of stamps- 120, 480 and 720 mils; SS - 1500 mils. 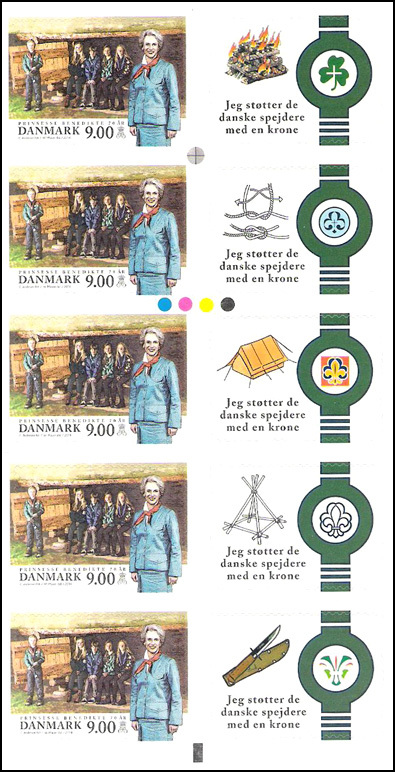 Designer: Anas Maraga. 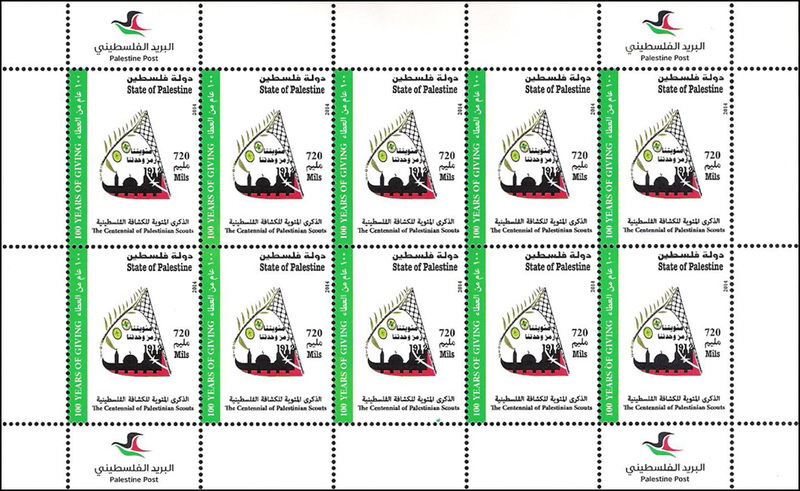 Printer: Oriental Security Printing Solution, Bahrain with 20,000 stamps and 2000 SSs printed. 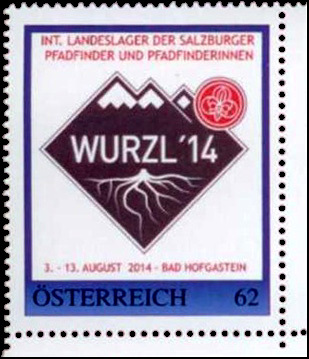 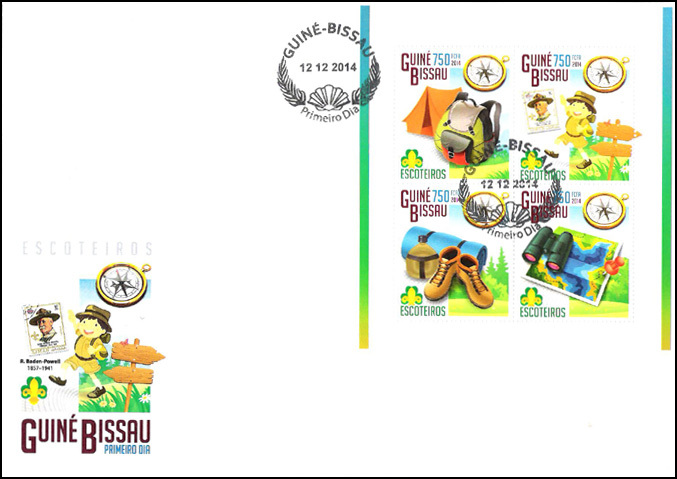 Stamp for WURZL '14, an International Jamboree of Salzburg Boy Scouts and Guides held at Bad Hofgastein from 3 - 13 August 2014. 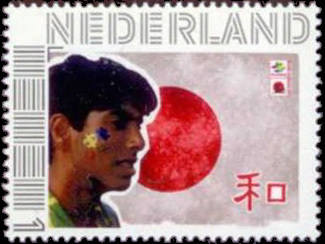 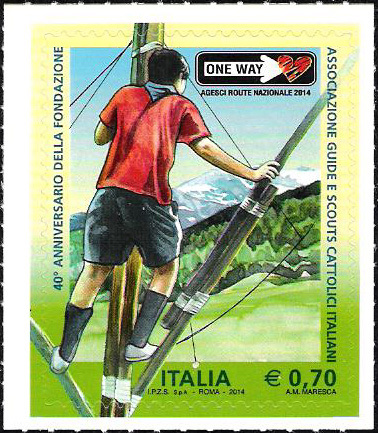 Stamp prepared in 2014 by a Scout as a way to raise money to pay for his trip to the 23rd World Jamboree in 2015 in Japan. 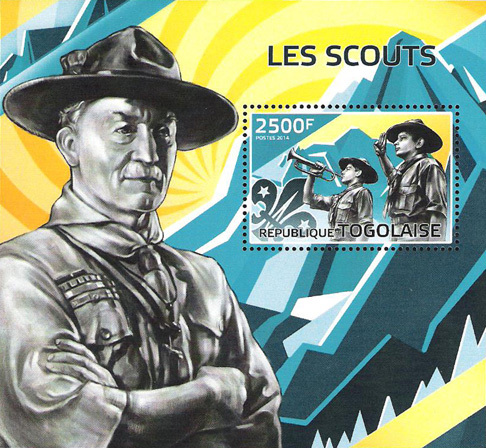 Note image of Scout against background of Japanese flag. 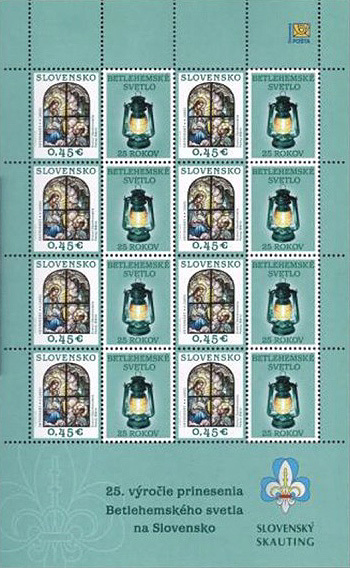 Lanterns signifying the Light of Bethlehem were printed in the gutters of a self adhesive sheet of 8 Christmas stamps issued on 14 November 2014. 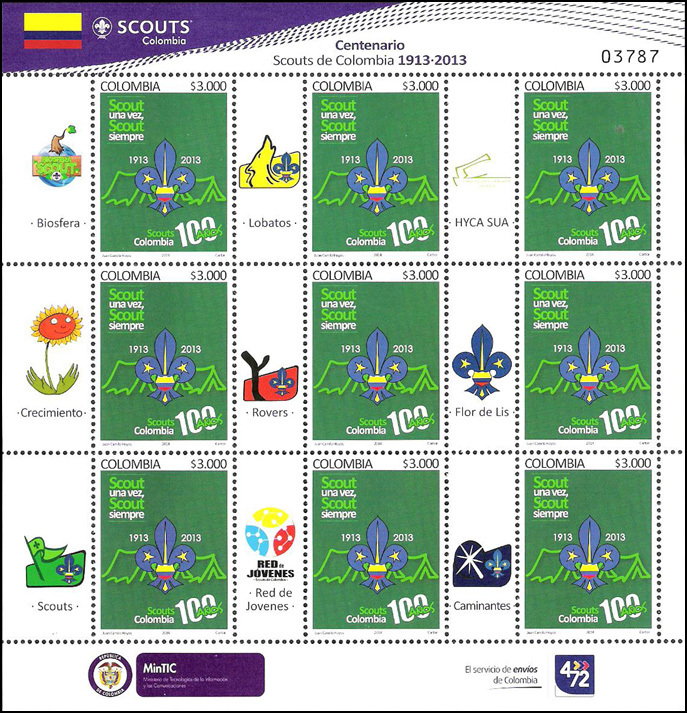 Scout emblems and words "Slovensky Skauting" were printed at the bottom right of the sheet. 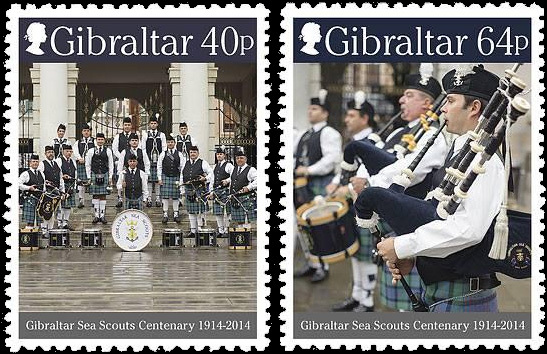 Evidently this may have been a fund raiser for the Scouts. 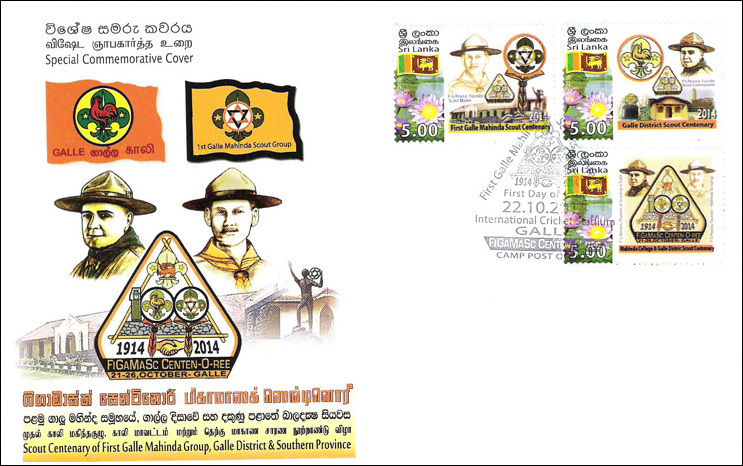 Three different tabs ("P" stamps) on special cover for Scout Centenary of First Galle Mahinda Group, Galle District & Southern Province. 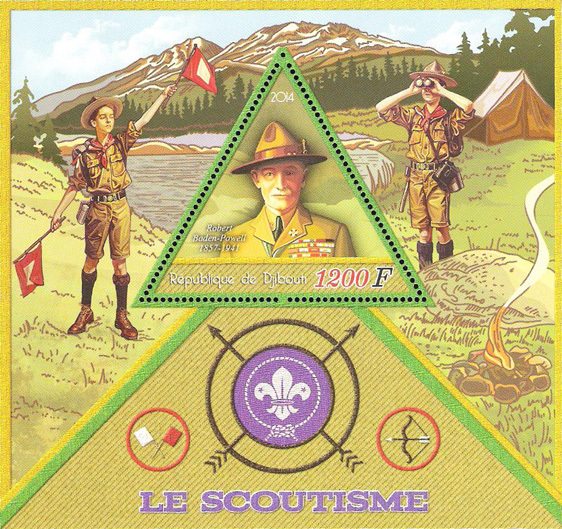 One tab shows F. G Pearce, a founder and Scout master and a second, F. G. Stevens, a founder and Scout Commissioner, and both men are on third tab. 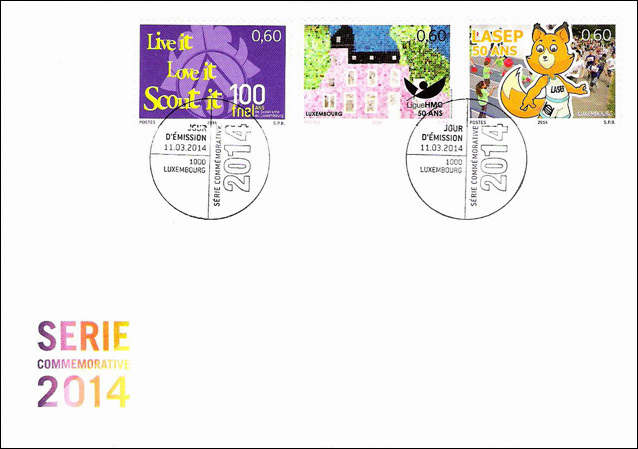 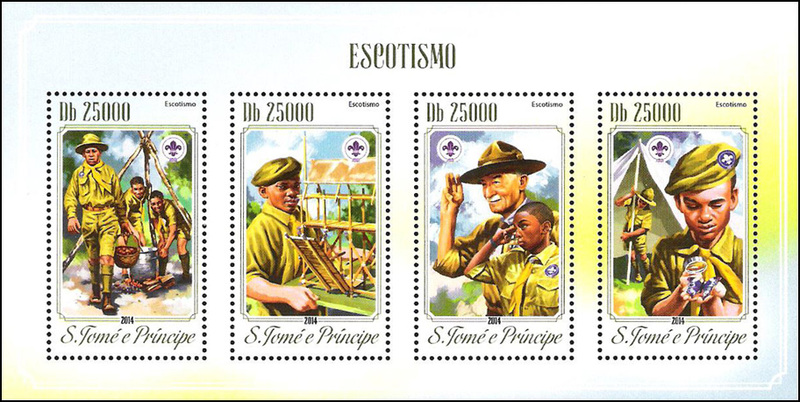 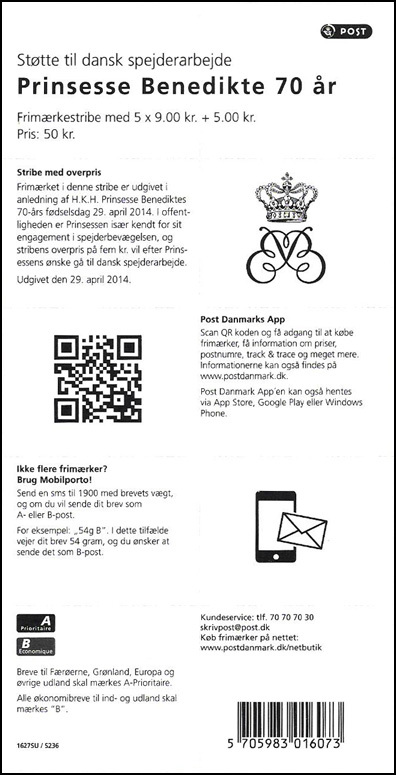 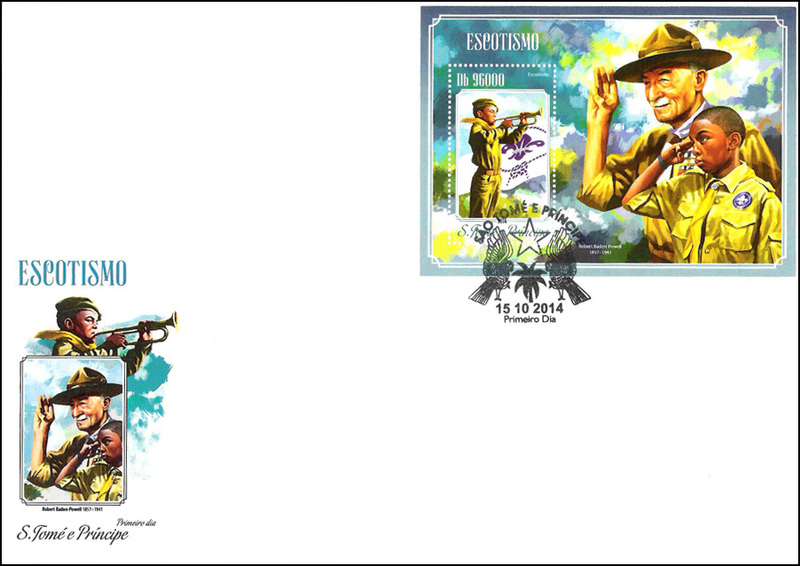 Stamps canceled with first day of issue (22 October 2014) Scout cancel at Galle, Camp Post Office.